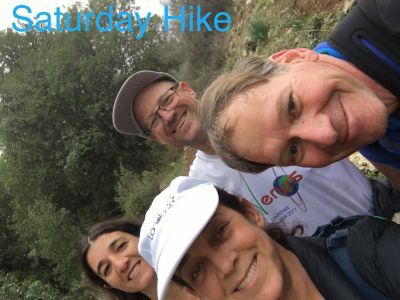 Daughter Vered Ron sent us some pictures of a day hike with husband Aviv and Mikhal and Moran Segoli in Nahal Dolev in the Bet Shemesh area. 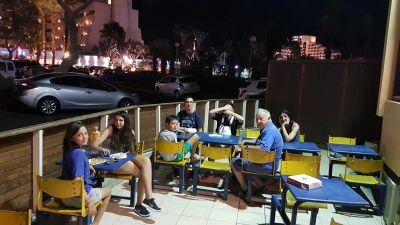 Enjoying hamburgers in an Eilat restaurant with the Eilat Levys - Doreen, Ilai, Amit (not seen), Limor, Itamar, Aviv, me. 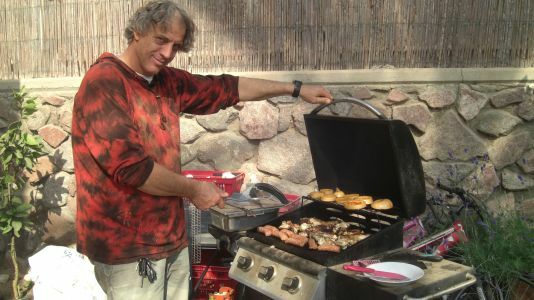 Even tastier was the lunch barbecued by Aviv. 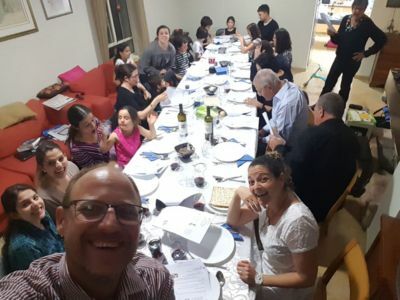 We had a most pleasant evening over dinner at our house this evening with some family, especially as it's been some time since the Kansky's and the Klotnicks met. 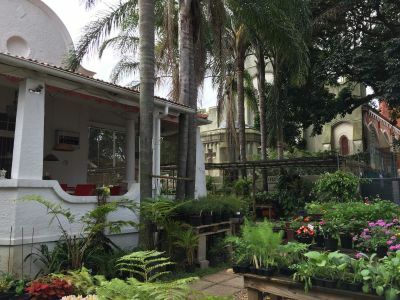 This is - or was - the house where I lived during my youth from a few years old till about aged 20 - 191 Musgrave Road, Durban, South Africa, next door to the St. Thomas Anglican Church. Between our house and the church there was a footpath that led to my high school, a walk of about 5 minutes or usually a run of 2-3 minutes not to be late. The house is now St Clement's Restaurant, with a Certificate of Excellence and rated 4 stars on Trip Advisor. 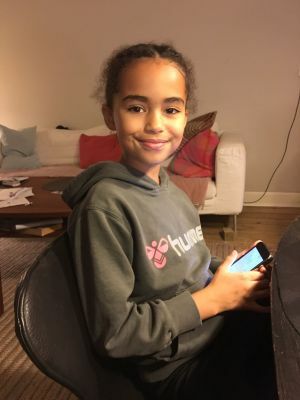 There is another picture in the Archives of This Week's Picture. 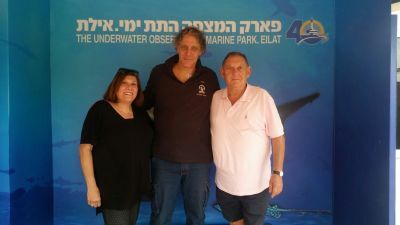 Belinda Levy, the ex-wife of my first cousin the late David Levy ז"ל (see Hershovitz and Matz family trees) is visiting Israel and she met our son Aviv at Coral World Marine Park where he is the curator. 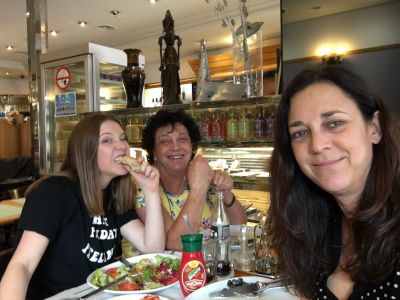 Moran was feeling better, I was feeling better, so what nicer way to celebrate than having a family lunch in Netanya. December 2017: Yael Galamadi comes for lunch. 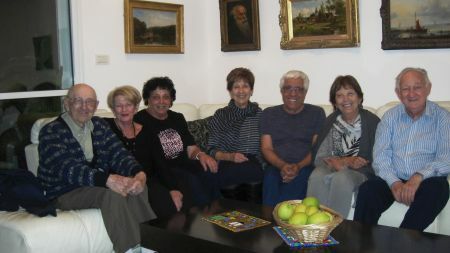 Yael Galamadi, a friend from our first days in Israel and whom we don't see too often, came over for lunch. 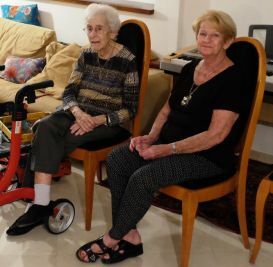 The Galamadis lived opposite us in our first home in Netanya. 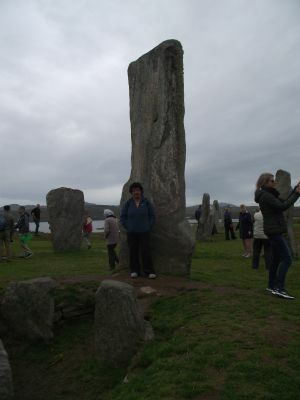 Yael and Doreen were pregnant at the same time and we became good friends with the Galamadis. 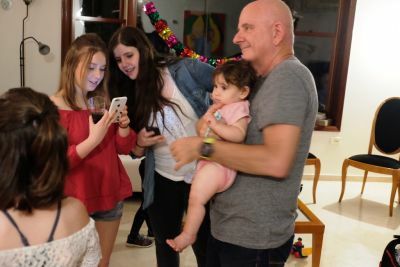 Our daughters, Vered and Ariella , were born within days of each other and the little girls spent a lot of time together at both apartments. 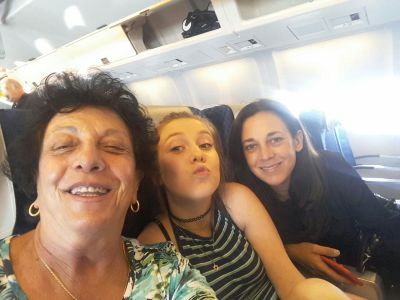 We spoke English to Vered, and the Galamadis spoke Hebrew to Ariella and because they were together so often, Avraham Galamadi was "abba" to both girls, and I was "dada" to both girls. 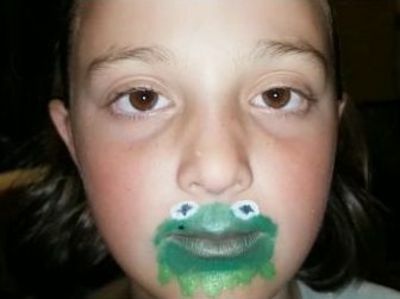 Some eyebrows were always raised in the neighbourhood whenever our daughter Vered called Avraham "abba". 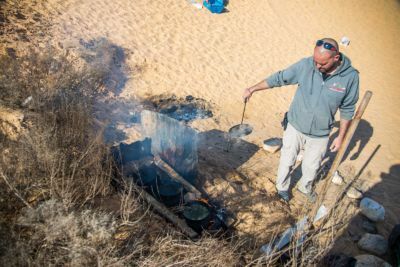 I always liked spicy food but I owe my love for very spicy food to Avraham's Tunisian "chreime" (fish stew) prepared by Yael. 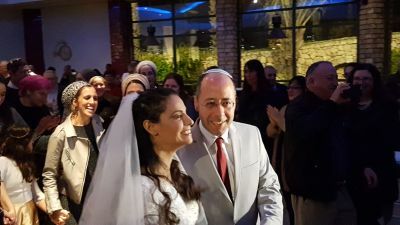 Mazaltov to Yori (Yehoram) Leshem (see Glezer/Glasser family tree) on his marriage to Michal Pellach. 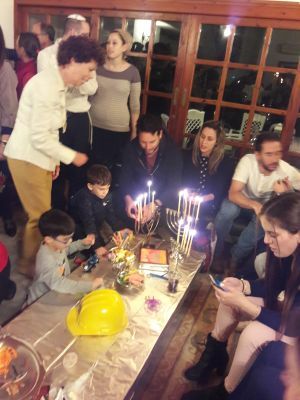 Yori and our son Moran and daughter in law Mikhal were colleagues and friends before they knew they were related. 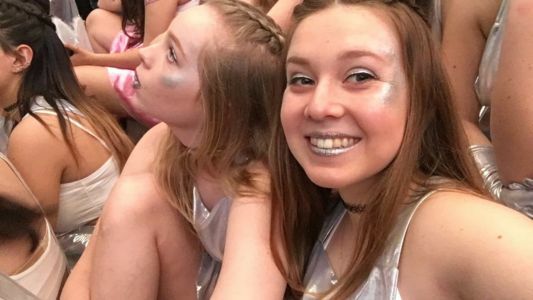 Read the story of our meeting in Davis, California. 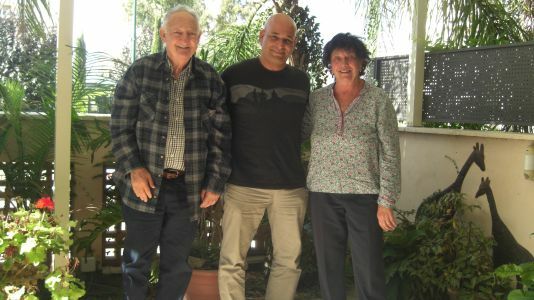 Doreen and I had a highly satisfying meeting with Gilad Shai (Avraham). 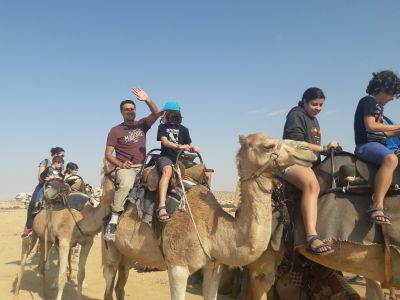 Gilad, who was Moran's friend, stayed with us in Eilat for nearly a year before they both went to school at Sde Boqer. 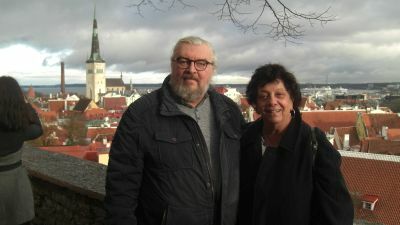 Unfortunately we lost contact over the years so we were happy to renew contact with him - a charming and positive adult. 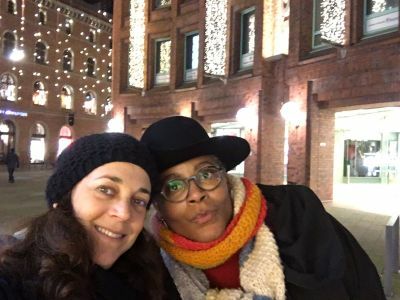 Vered managed to squeeze in time with long-time friend Patisa Rasmussens and her daughter Sofia, who came to Hamburg to meet her. 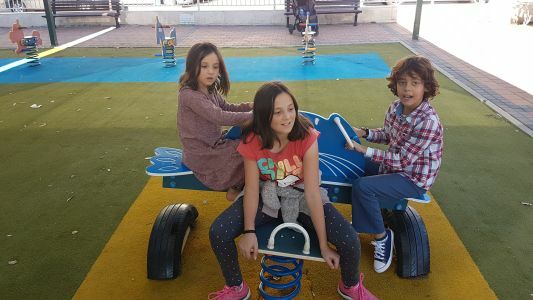 November 2017 - "Be Brave, Saba"
While in hospital the Eilat grandchildren sent me this encouraging picture, labelled by grandson Itamar "Be brave, Saba!" 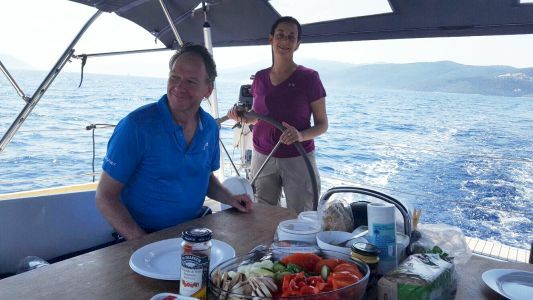 November 2017 - Skipper Vered takes friends and Doreen on a morning sail. 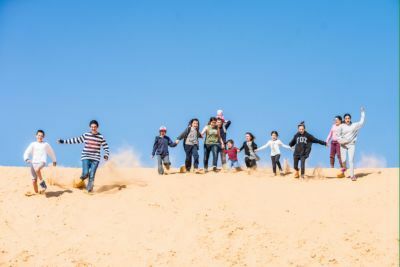 The Segolis visited the Huleh Nature Reserve and area and saw the migrating cranes. 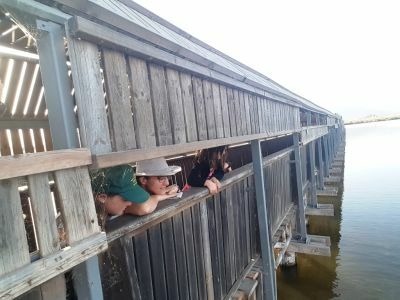 The Nature Reserve has "birding hideouts" from where the birds can be viewed without disturbing them. 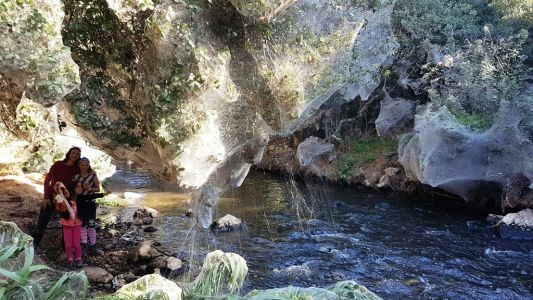 The Soreq Creek near Jerusalem contains nutrient rich water (from treated sewage) that attracts millions of tiny non-biting midges that are an abundant food for long-jawed spiders who spin large tapestry-like webs. 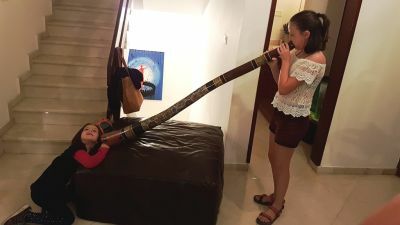 Read more about this rare phenomenon in the Haaretz newspaper, and see more pictures of the Segolis in the Archives and on the pages of Lotem and Maayan. 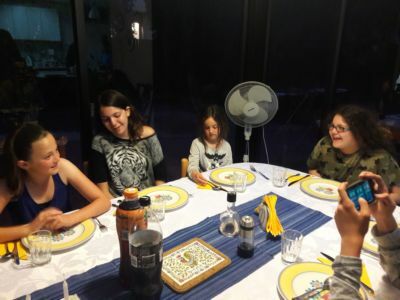 After Amit Levy's 12th birthday party (See pictures here) Dad Aviv, Mom Limor and siblings Itamar and Ilai took her for a weekend to Tiberias. 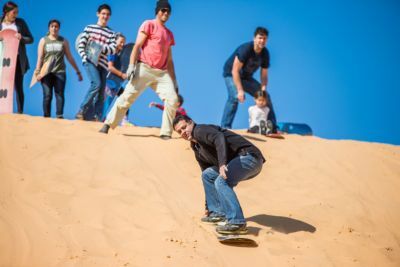 After an intensive week overseas in Riga and Tallinn we returned home, but a few hours later I was again in an aeroplane, this time flying to Eilat where I was a tournament director at the Eilat Bridge Festival. 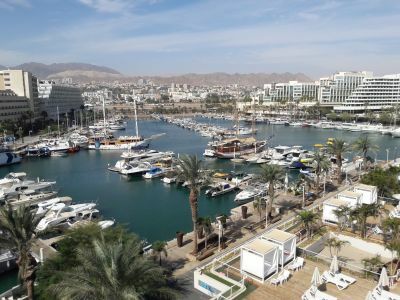 We stayed in a hotel by the marina and loved the view from our verandah. We felt we were back overseas. 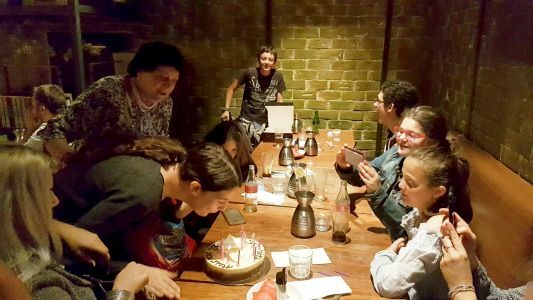 November 2017 - Amit levy is 12! 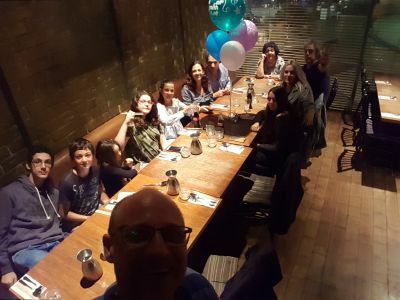 Although granddaughter Amit Levy did not want a batmitzvah celebration she was delighted when our family organized an impromptu surprise 12th birthday party at a Tel Aviv restaurant . 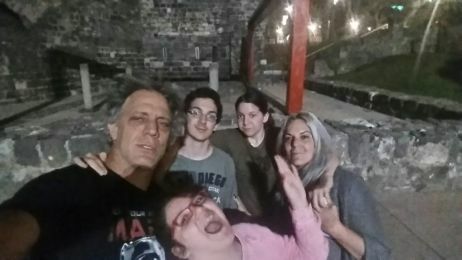 Afterwards Dad Aviv, Mom Limor and siblings Itamar and Ilai went for a weekend to Tiberias where they had a great time. 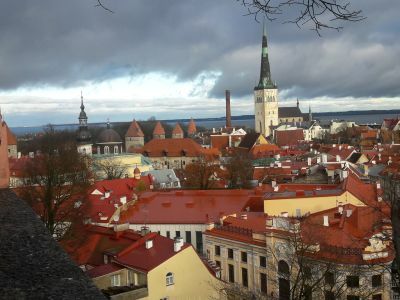 The Old Town of Tallinn is beautiful and scattered with innovative benches. We later enjoyed an excellent meal at the meat restaurant behind us. 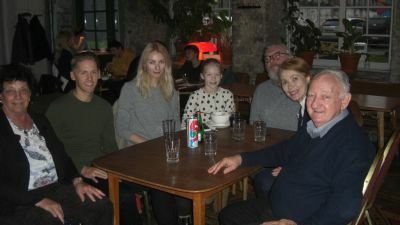 We were delighted to meet some of their family; daughter Triin and son-in-law Jannus and granddaughter Emma. 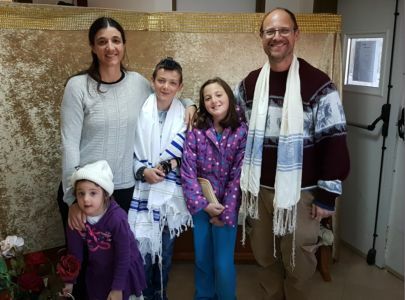 In the picture on the right, Heini is holding his "rabbit" a cherished present made for him decades ago by the late Channa Drui (Doreen's father's cousin) before she moved to Israel. 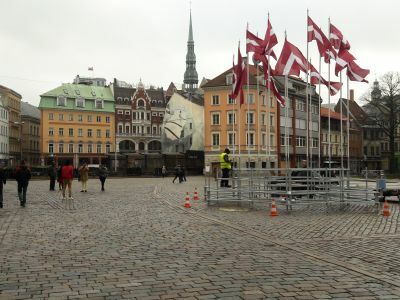 We visited Riga for the European Bridge Champions' Cup. 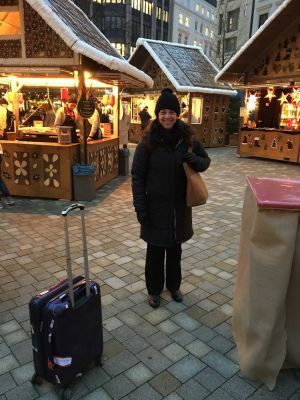 We made a very short visit to Riga last July but the visit this time was painful for Doreen,as she has now determined that the synagogue where her grandmother was burnt to death during the Holocaust was in Riga. 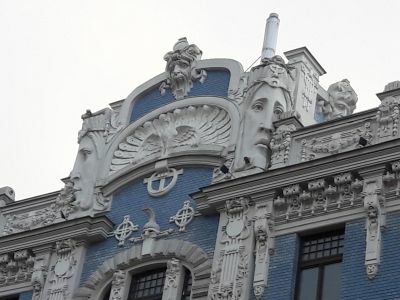 Read Doreen's Thoughts on a Visit to Riga..
Riga is very beautiful and Doreen took the opportunity to walk through the streets of the Old Town and also to see the Art Nouveau buildings. 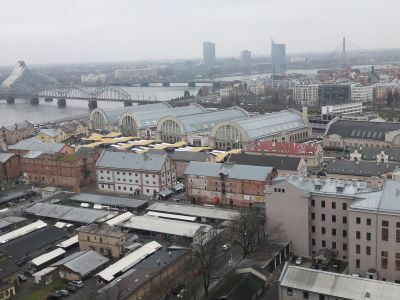 View of Riga from the top of the (Russian) Academy of Science building. 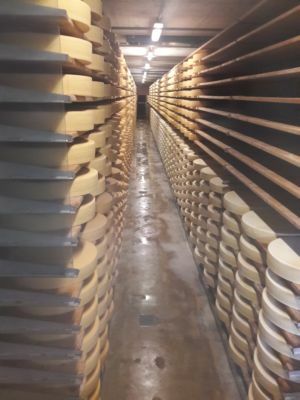 The interesting market is in four former zepelin hangars, bought from Germany after WWI. 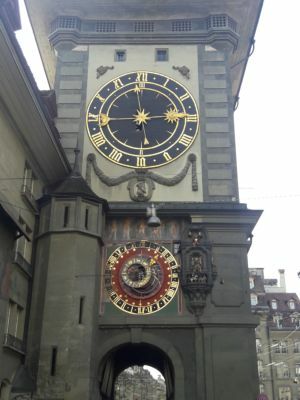 The Old Town is very beautiful with many interesting and impressive buildings. 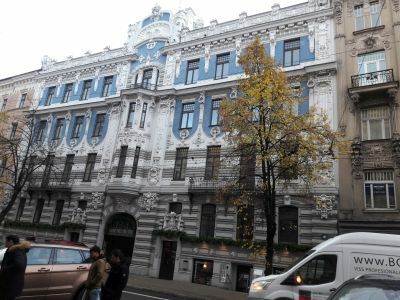 Historic Riga is a World Heritage site with the largest collection of Art Nouveau buildings in Europe. 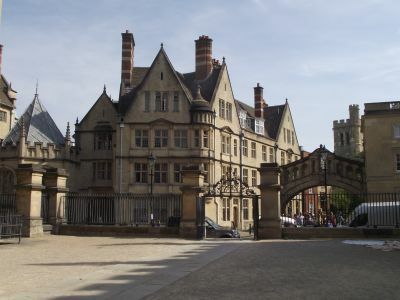 Up to 40% of the buildings were built in the early 1900's and are maintained in perfect condition. 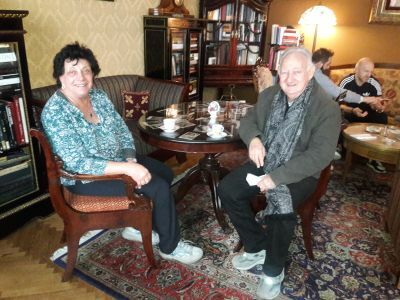 Eitan and I relaxed in the beautiful Art Nouveau Sienna cafe after walking through the Art Nouveau area. 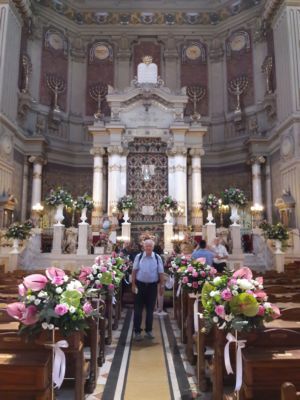 Click for a picture of the beautiful Riga synagogue. 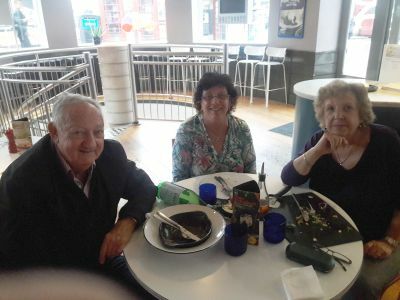 We were delighted to meet up again with old friend Judy Pirkey, who was on a cruise with her husband Fernando. 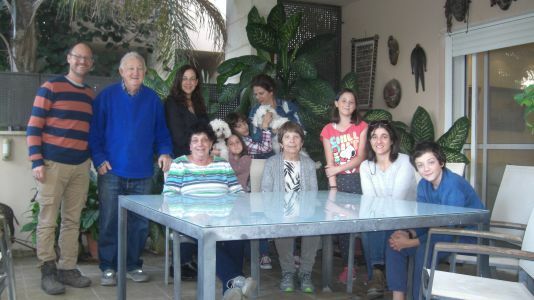 Doreen prepared a delicious lunch and we were joined by friend Morris Kahn and daughter Vered. 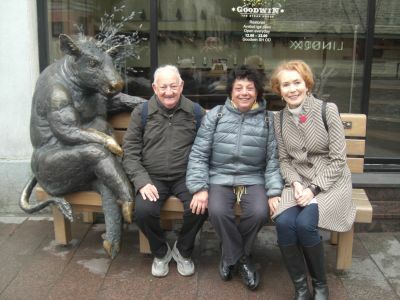 We had not seen Judy for about 25 years and we enjoyed talking about the "old times" and sharing memories. 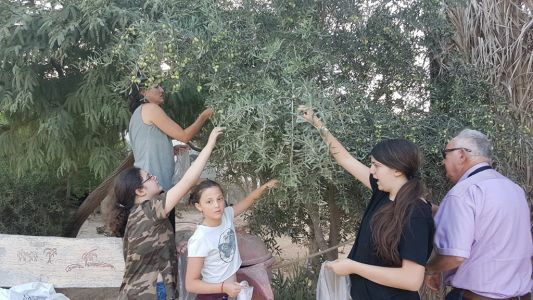 While we were at the caravanserai for Lotem's party (see below) Doreen used the opportunity to enlist the family in picking olives for her to pickle. 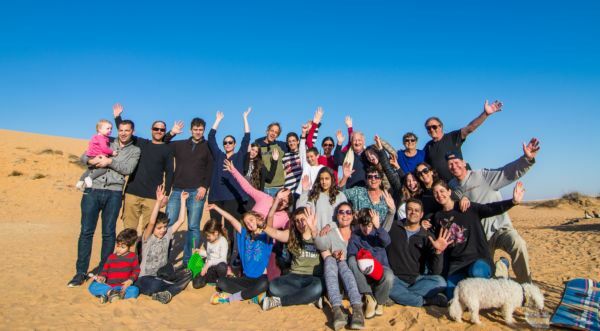 Granddaughter Lotem Segoli turned 12 and the Segoli and Levy families celebrated with her at her batmitzvah event. 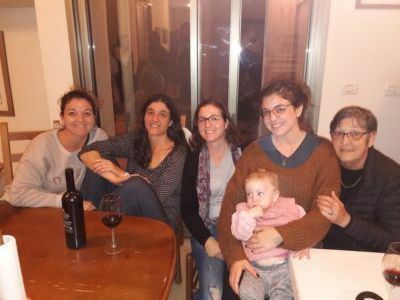 Friday evening we celebrated at the Caravanserai (Khan Shayarot) tent village not far from her home in Midreshet Ben Gurion, and on Saturday we all lunched at her home. and of course birthday celebrations - including delicious cakes! 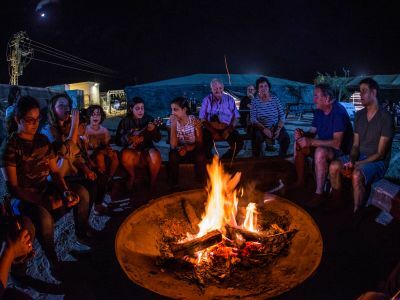 Evening entertainment was sitting around a camp fire (a "one-match-Levy" fire) talking, and singing to the accompaniment of Nitzan on the ukelele. 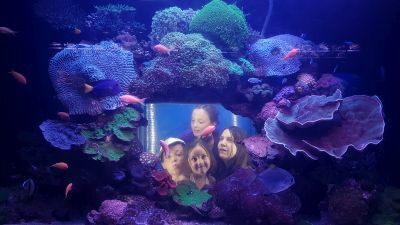 We were fascinated by the spontaneous dancing of 7 -year old Mili. 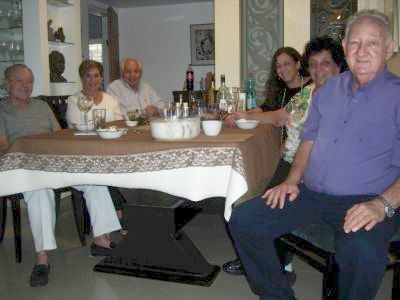 Lunch at the home of Moran and Mikhal Segoli ended the most enjoyable weekend. 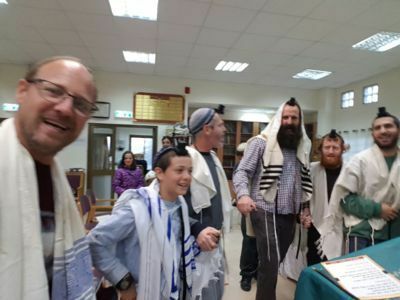 October 2017: Almog Collins celebrates his bar mitzvah. 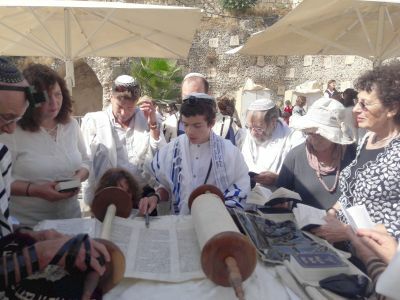 We celebrated the bar mitzvah of Almog, grandson of best friend Caroline Collins, at the Western Wall in Jerusalem. 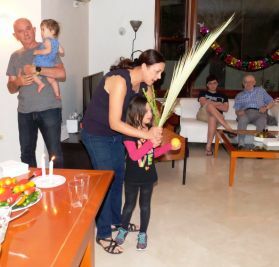 For the last few years the Levy family tradition of celebrating the festival sukkot together lapsed. 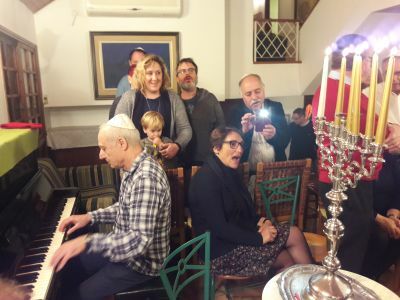 This was a great pity for we had many lovely evenings at the home of Wendy Kansky, the daughter of cousin Shirley Kansky (for example see here) . 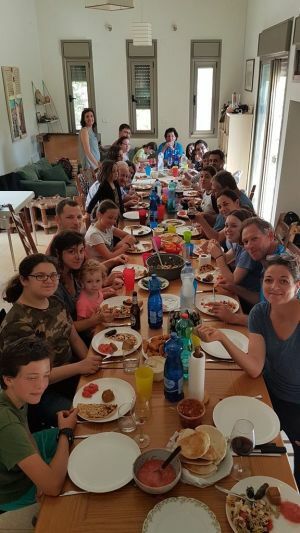 This year Wendy, daughter Vered and cousin "in-law" Dina Levy decided to renew the tradition and the Levys with the addition of some of Dina's family, enjoyed good company and delicious food at the home of Jonty and Dina. 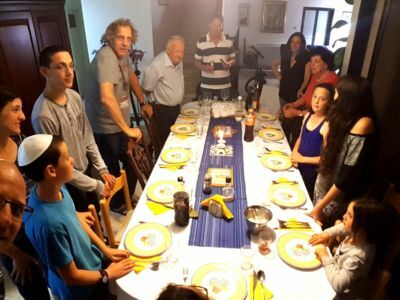 Four generations of Levys get together for a sukkot celebration. 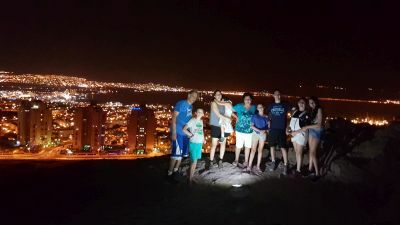 We stayed 5 days in Eilat during the Rosh Hashanah long weekend and apart from eating most of the time we also had time for some other things. 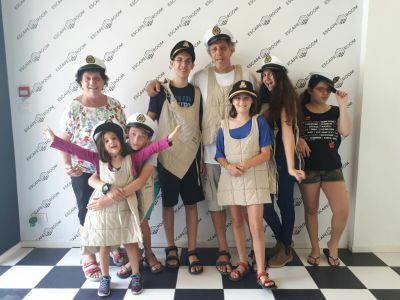 a dive (Doreen, Aviv, Moran, Maayan, Amit) - see Amit underwater - and a visit to the "Escape Room"
Vered from Germany - Aviv from Chicago - Danielle from California - Lior from Israel: all met up at Boston airport. 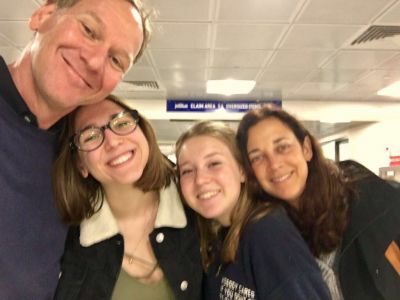 After spending a few days together, Danielle will go back to California and the rest will fly back to Israel. 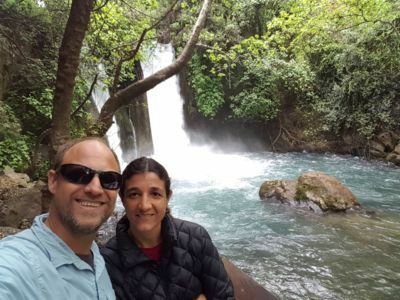 Vered and Aviv sailed with 4 friends in the Greek Isles. 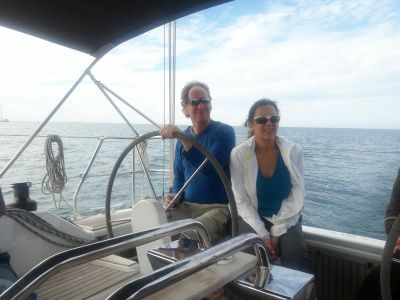 Vered was the sole skipper and we're very proud of our sailor daughter. 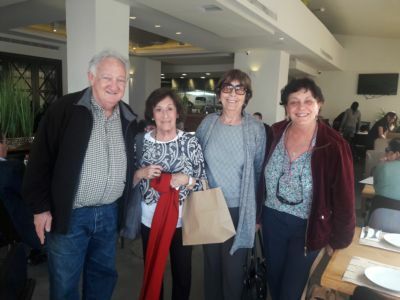 While in London we had lunch with Shirley Poluck, long-time friend from our first days in Israel at the Hebrew Ulpan in 1965. 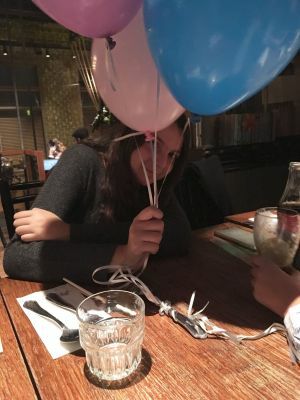 We see her quite often, in Israel (for example) or in England. 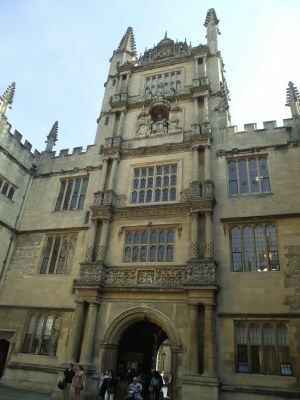 On the way back to Israel from our cruise we spent a few days in London and took the opportunity of visiting Oxford, where we had never been. The highlight was a visit to the marvelous Ashmolean Museum. 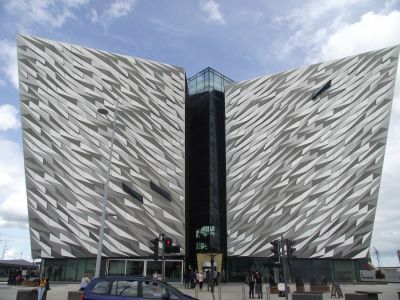 The museum is definitely worth a visit. 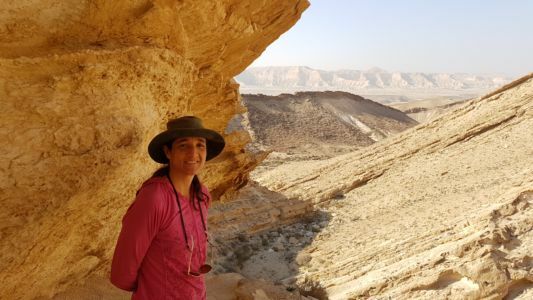 There are amazing exhibits of archeological finds, and we spent hours in the Egyptian and Middle East Sections, so didn't have time for the other exhibits. There was also an exhibition of Rafael drawings which Doreen skimmed through. 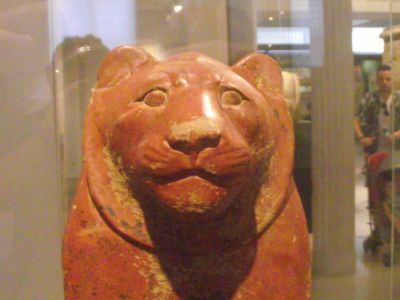 A sculpture of a lion with a realistic face and stylized body. 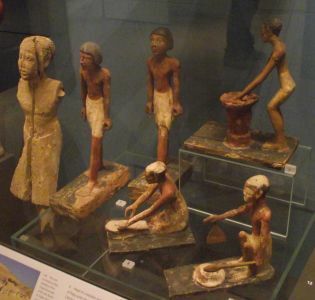 Some small Egyptian figurines including preparing bread and preparing beer. 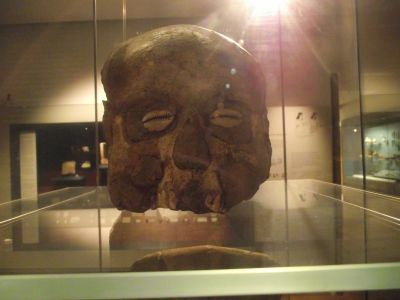 An 8,000 year-old plastered skull from Jericho (note the sea shells in place of the eyes). 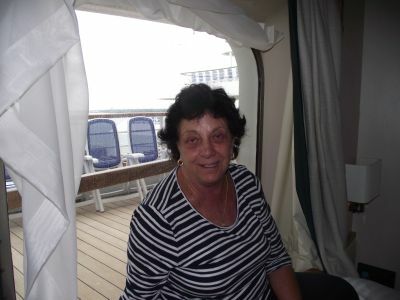 Doreen is preparing an account with pictures and more details of the cruise. 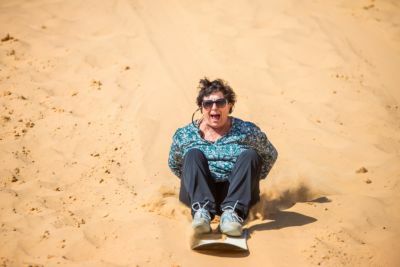 << *later: Click for Doreen's account and impressions>> but in the meantime below are some pictures of some of the highlights. and Dublin, Ireland, where we saw the sites and spent an delightful day with my Dubliner bridge colleague Paul Porteus and his wife Maureen. 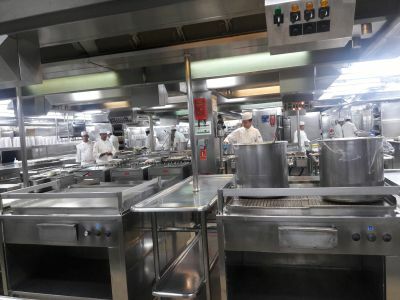 The day before we disembarked in Southampton Doreen went on a tour of the Oriana's impressive ship's kitchen. 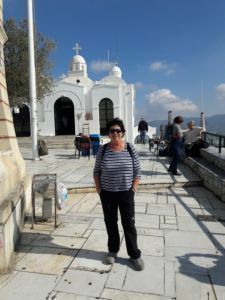 Doreen will prepare an account with pictures and more details when the cruise has finished, <<*later: Click for Doreen's account and impressions>> but in the meantime there are some pictures of some of the highlights here. 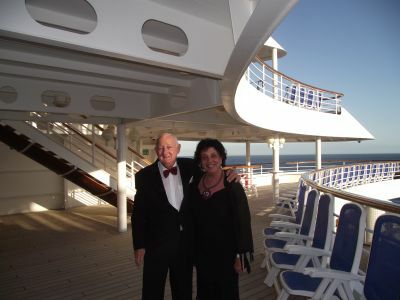 We're on board the Oriana on a 14 day cruise. Our cabin was a pleasant surprise - it's larger than we thought and there is a large window looking out to the deck and sea. 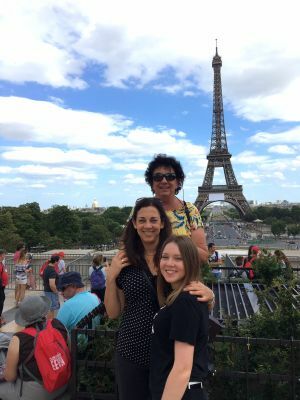 Three generations - Doreen, daughter Vered and granddaughter Lior - are in Paris for a 5 day visit. 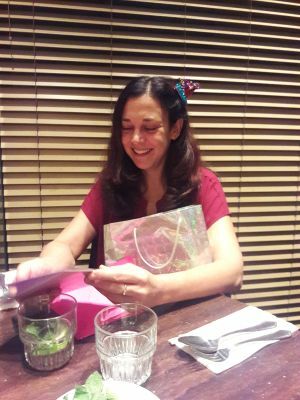 For Lior this is extra special, for she was born in Paris. 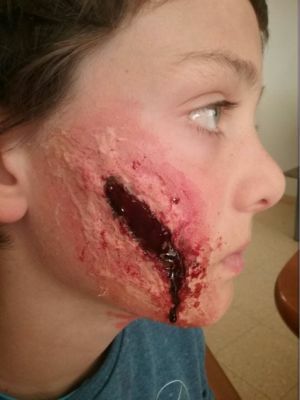 More pictures on Lior's page. 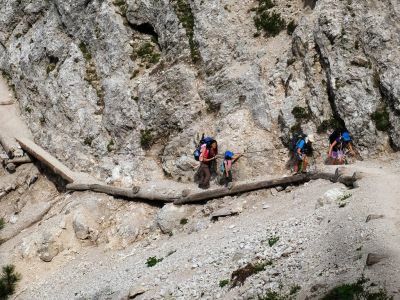 The Segolis - Moran, Mikhal, Maayan, Lotem and Zoe - are in north-eastern Italy trekking in the Dolomites. 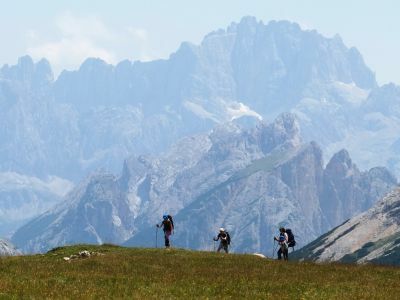 They will be there for about 2 weeks, carrying all their clothes and supplies with them, and spending the nights in the rifugi - the huts along the trekking paths. 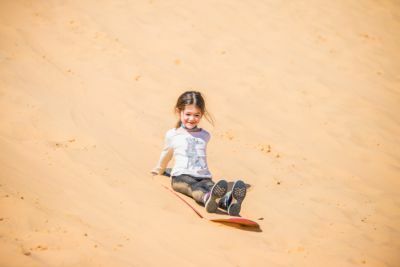 More pictures on the pages of Maayan, Lotem and Zoe, and in the Week's Picture archives. 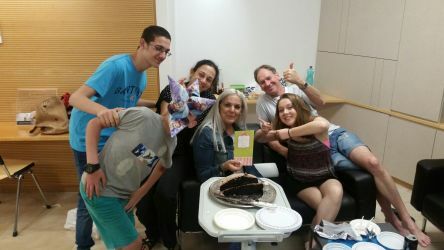 While Ilai was in hospital (see here) the Levy family organised a Friday night dinner for her and mom Limor's birthday at the hospital. 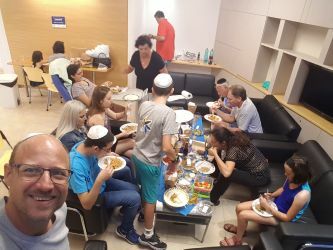 All 14 family members came (except for Danielle who is in America and Amit who is in Eilat now after helping Ilai during the hardest first days). 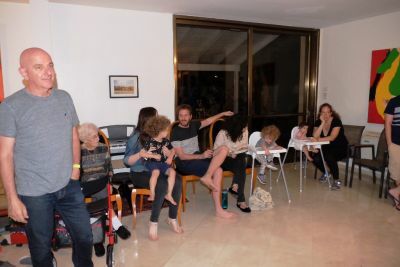 We took over the visitors' lounge and it was a really lovely occasion. 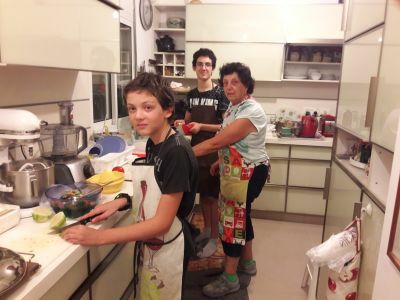 During the hard week when granddaughter Ilai was in hospital our grandsons Maayan and Itamar helped with the cooking! 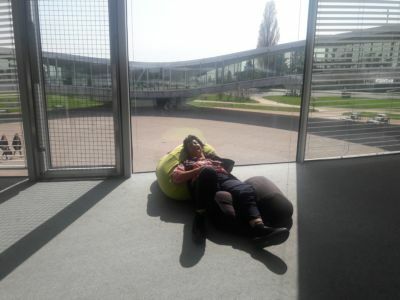 We enjoyed our 8 day stay at the X-Bionic Sphere Complex near Samorin, Slovakia. 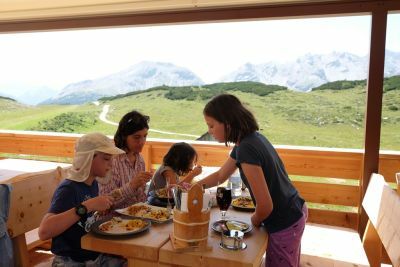 The bridge conditions were excellent, the hotel suite large and comfortable and the hotel food varied and good as well as other excellent restaurants. 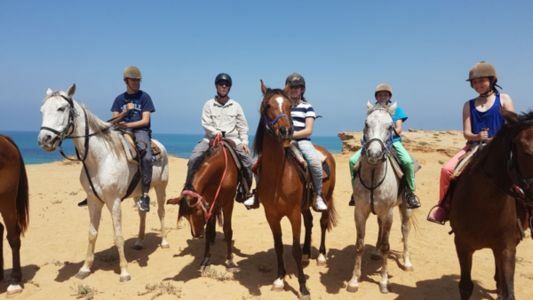 The venue is both a horse training facility (complete with stables, show areas and a hippodrome) and a training centre for olympic and other sports, and includes an exceptional gym where Doreen spent some time. 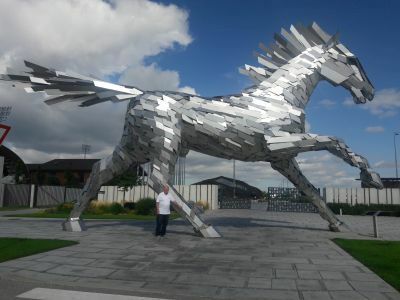 The impressive statue of a horse, consisting of thousands of stainless steel plates, is the largest horse statue in the world and stands at the entrance to the horse traing centre. 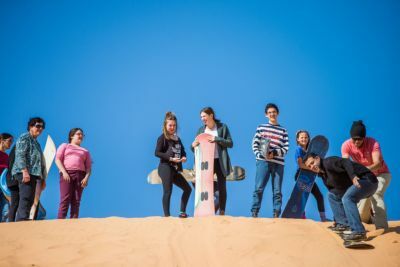 Apart from the bridge contestants there were sportsmen and women from all over the world - for example national football teams and swimming teams, and also many youth enjoying summer camps. Doreen even received a T-shirt from a Qatari youth consellor in charge of a youth summer camp. 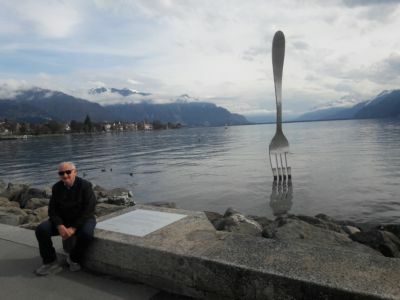 One of the restaurants is Farrier's. (A farrier is a specialist in the care of horses' hooves). The Tournament Directors ate there one evening. 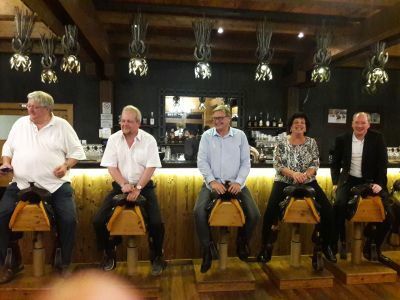 The theme of the restaurant is horses and horse riding, and the bar stools were moving saddles, enjoyed first by Doreen who was quickly joined by Josef (EBL Treasurer), Peter (TD from Germany) , Yves (EBL President) and Fearghal (TD from Ireland). The excellent venue at the hotel even included a luxury cinema with screenings during the day and evening. 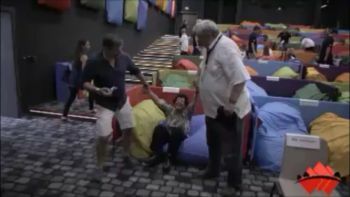 The awards ceremony of the Under 16 Competition was held there, and Doreen enjoyed the extra comfortable lounging seats - once you were in a seat it wasn't easy to get up - Click here or on the picture. 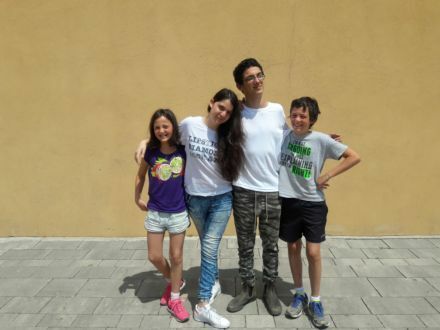 Amit and Ilai Levy spent the weekend with Aunt Vered, and met the Sde Boqer Segolis at the Israel Museum in Jerusalem. 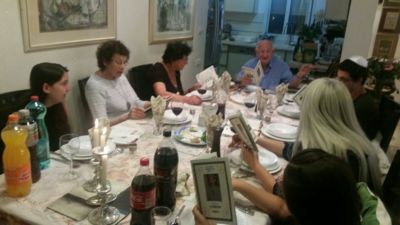 Breaking the Silence held a marathon reading of soldiers' testimonies in Tel Aviv. Because the present government is trying to prevent soldiers from recounting their experiences while serving in the army, volunteers were reading the testimonies without recalling the reservists' names. 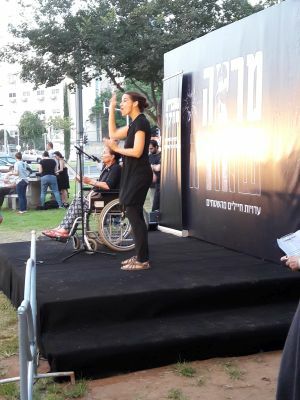 Here Yael Dayan (the daughter of the late Ruth and Moshe Dayan) a staunch supporter of Palestinian rights, sits in a wheelchair and despite needing oxygen to help with her breathing is reading out one of the testimonies. The volunteer standing next to her is signing for the hearing impaired.The testimonies we heard were nothing shocking (althoough we have heard some in the past), rather saddening because of the trauma they caused to the soldiers and also to think to what length the present government will go to to prevent any criticism or recounting of the army policy or lack of policy in the West Bank, embittering the lives of the Palestinians living under the occupation. 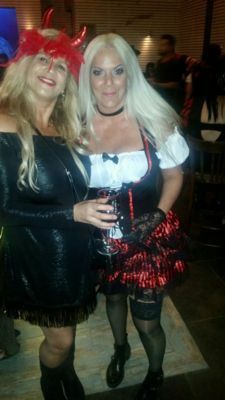 (see also Doreen's Column from last year) . 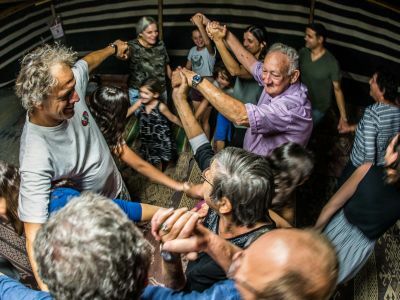 Between our trips to Monmtecatini and Samorin there was the Tel Aviv Bridge Festival. 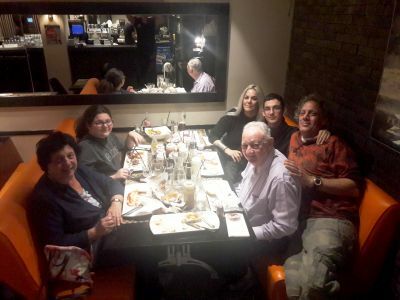 Doreen took some of our guests from overseas for tours - the President of the World Bridge Federation Gianarrigo Rona (with Cippi his wife and Carlotta their daughter), Ton Kooijman, Chairman of the World Bridge Laws Committee and Irving and Jackie Gordon from Scotland. 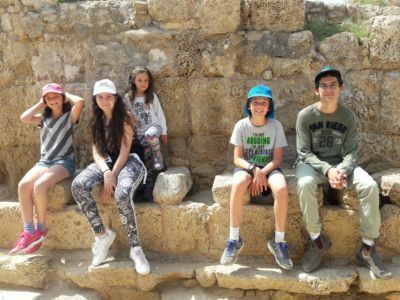 Tom and Eitan with some unknown hangers-on sit on the ancient stone toilets at the entrance to the hippodrome in Caesarea. 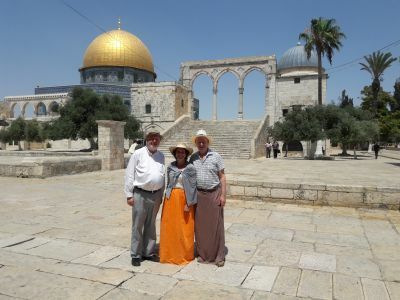 Sandy Duncan from Scotland stands with his bridge partner Irving Gordon and his wife Jackie on the Temple Mount. 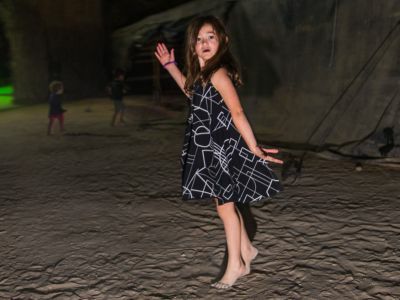 Dress regulations on entering the Temple Mount have been drastically changed at the exhorbitant price of NS25 per item of clothing! 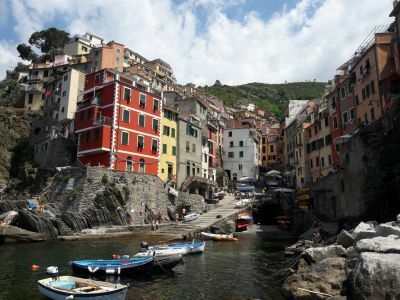 The coastline of Cinque Terre, five villages nestled against the backdrop of steep terraces and green hills on the Ligurian coastline is dramatic, I boarded a ferry at coloful Riomaggiore, passing Manarola to arrive at Monterosso al Mare, the only village that has a beach. 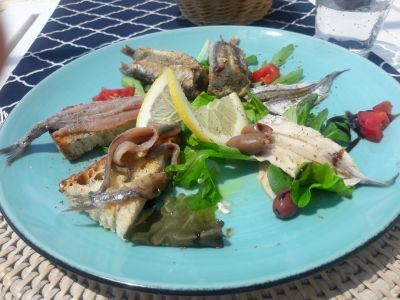 Anchovies have a protected designation of origin and are a local speciality as is their pesto. 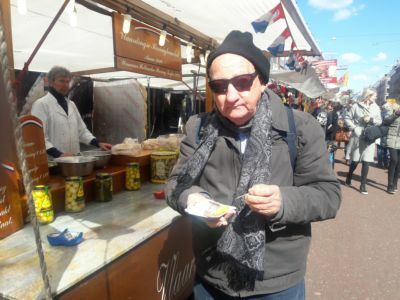 I enjoyed delicious anchovies pickled, preserved in oil, and stuffed with pesto for which they are justly famous. 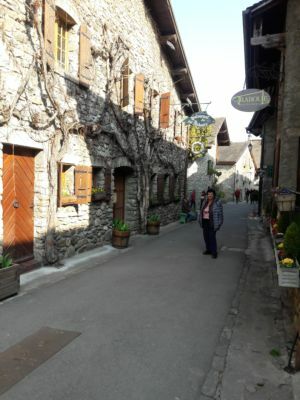 Exploring the steep narrow alleys of all the villages is rewarding and full of surprises. 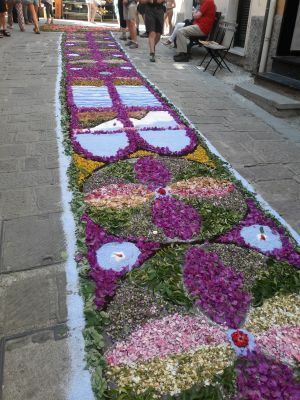 In Monterosso tens of people were preparing intricate pictures in the alleys from flowers, leaves, colored sea salt, polenta and coffe in preparation for the Feast of Corpus Domini an important Catholic holiday After mass in the church a procession with giant crosses passes through the streets with everyone walking over the intricate designs. 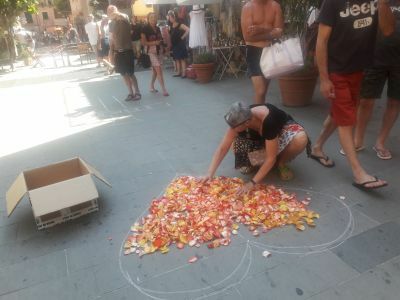 Montecatini is favorably situated to visit numerous places in Tuscany, among them Florence. 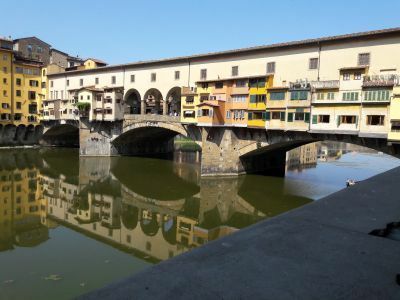 This picture of the famous Ponte Vecchio Bridge brought back happy memories of a previous visit to Florence with a few friends. 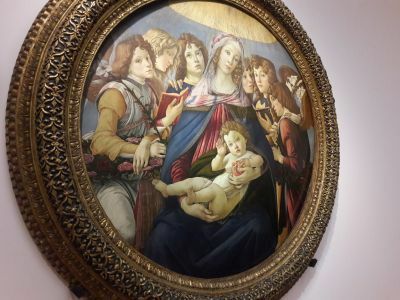 Despite aching feet I spent 5 hours in the famous Uffizi museum unable to pass up even one famous painting. 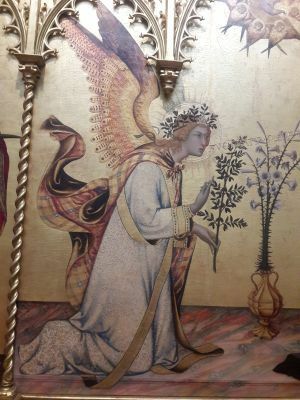 The angel is part of a panel by Simone Martini and Lippo Memmi. The angel Gabriel has just landed in a flurry and if you look carefully you can see the words he speaks in the embossed gold almost like a modern cartoon. 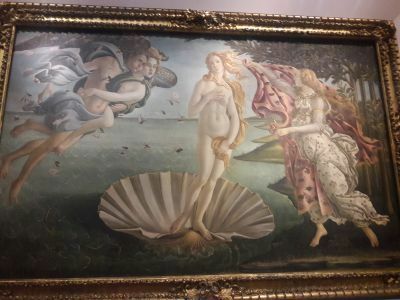 Bottecelli's The Birth of Venus is perhaps the most famous painting in the Uffizi but I liked the Madonna of the Pomegranate reminding me of our tree back home. 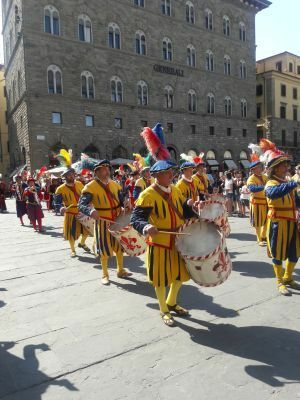 In the Piazza della Signora an elaborate parade passed with elaborate costumes, bands and flags in preparation for a feast day parade honoring St John a few days later. 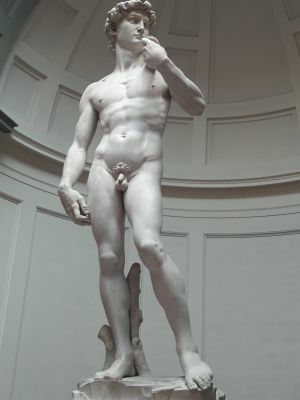 In the piazza is a copy of the famous David statue by Michaelangelo but nothing can prepare you for the dramatic encounter with the statue in the Galleria dell' Accademia. 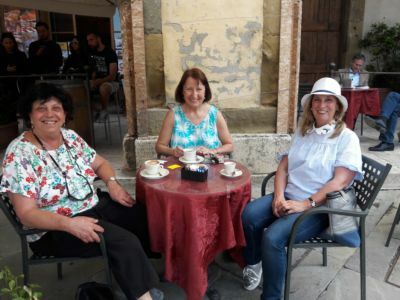 During our visit to Montecatini for the European Bridge Championships Doreen has been her usual active self while I have been attending meetings. 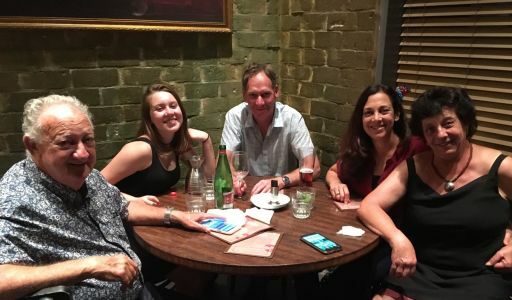 We meet in the evenings for dinner and so far have only found very good and excellent restaurants. 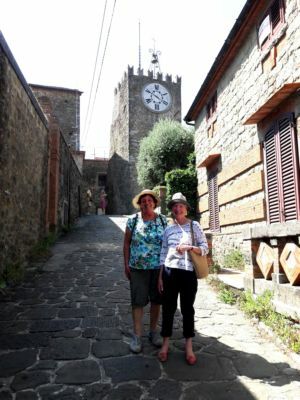 Doreen climbed the mountain to Montecatini Alto, twice, instead of taking the funicular. 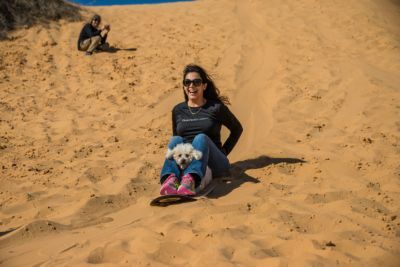 Here she is with Marianna Pencharz . 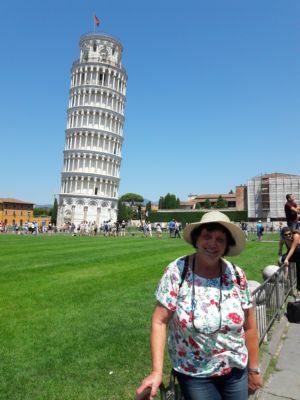 The last time we visited Pisa the tower was closed with scaffolding marring its beauty. 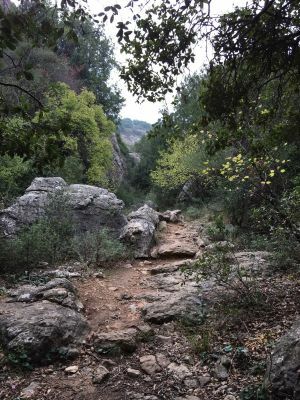 The incline has since been corrected by 5 degrees by excavating underground. 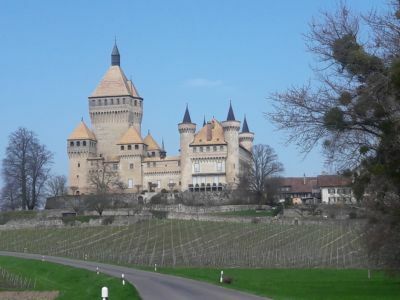 To enter the tower one has to walk down steps because it has not only inclined but sunk.This time Doreen climbed the tower and circling the top gallery one certainlly felt the slope of the tower. As usual Doreen takes along wives of other Executive members. 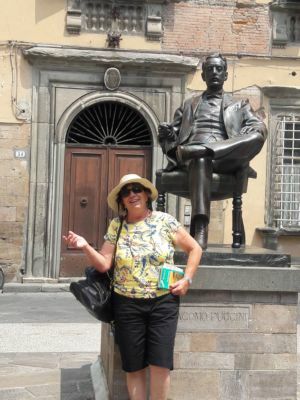 In Luca she was with Claude Aubry and Nansy Laurant, and they visited the .house and museum in Lucca where Puccini was born. 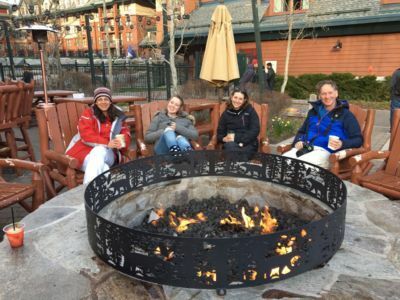 The bridge meetings are also an occasion for meeting old friends, some of whom we also visit outside of the bridge events. 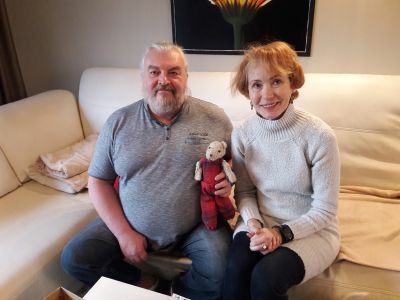 We were happy to meet up again with Bill and Marianna Pencharz. 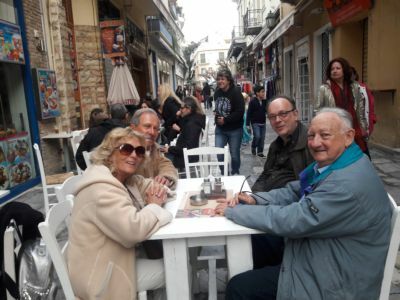 Bill was President of the EBL when I attended my first major international bridge championships 20 years ago as a Tournament Director - also in Montecatini. 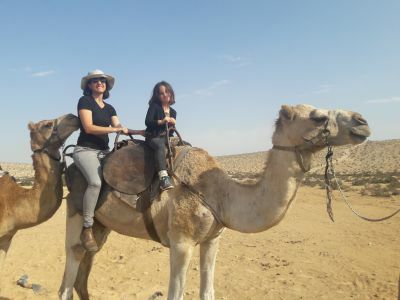 About 5 years ago Doreen and Marianna visited Timbuktu together. 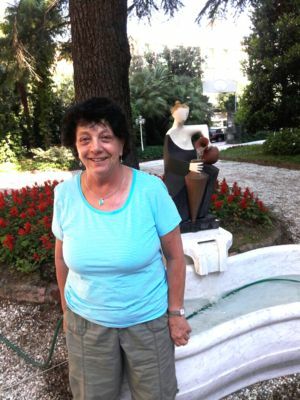 We are in Montecatini for a bridge competition and will celebrate Doreen's birthday in a suitable restaurant. 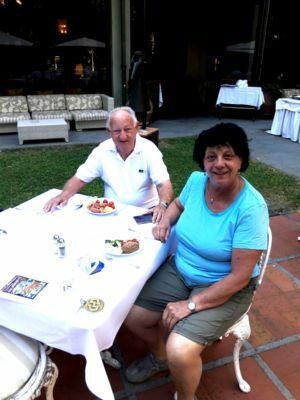 In the meantime we are enjoying an outdoor breakfast at our hotel. 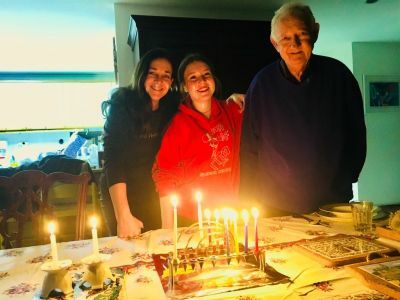 Doreen received birthday greetings from daughter Vered and Aviv in Cyprus, from son Moran in Rhodes , from son Aviv in Eilat, from granddaughter Danielle in USA, and from our grandchildren in Raanana, Sde Boqer and Eilat. 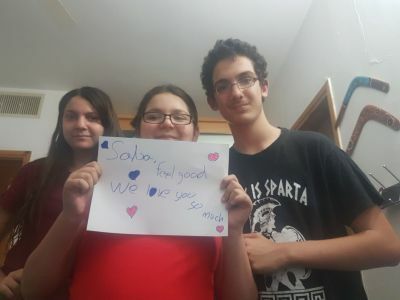 So, from Montecatini in Italy, Doreen says "Thank you all!" 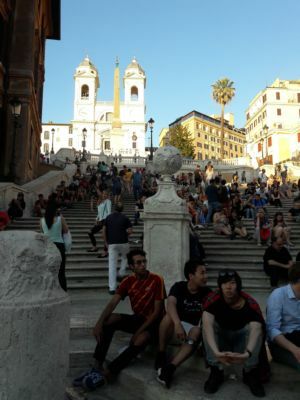 No visit to Rome is complete without time spent sitting on the Spanish steps; we passed it three times as our favorite restaurants are nearby. 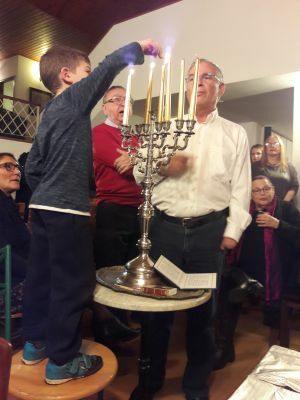 As is our custom we visited the synagogue and enjoyed an excellent temporary exhibition La Menorah, which we had seen advertised by a banner in Saint Peter's Square. 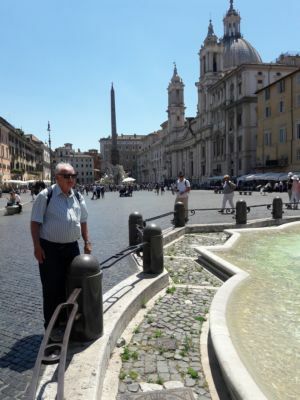 Eitan stands in Navona square. The buildings are built around an enormous hippodrome built by Domitian, the brother of Titus and known for his persecution of Chrisians. 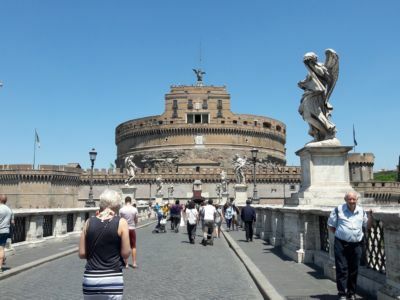 Castel Sant' Angelo by the Tiber River has had many transformations. Built originally as a mausoleum for Hadrian, it later served as a place of refuge for popes in uncertain times, as a citadel and as a prison. 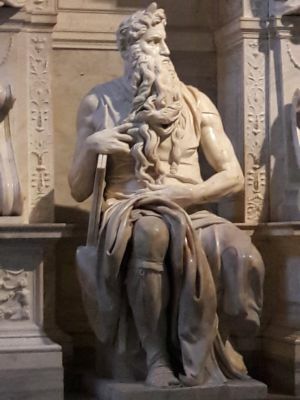 It is interesting that while Hadriain is well thought of as an enlightened emperor, in Jewish sources he is reviled as the emperor who not only put down the Bar Kochva rebellion but plowed Jerusalem under and built a new pagan city Aelia Capitolina in its place. In Lucignano in Tuscany, Italy I attended a meeting of the European Bridge League Council which is held at the beautiful villa of Fillipo Palma, a fellow committee member. 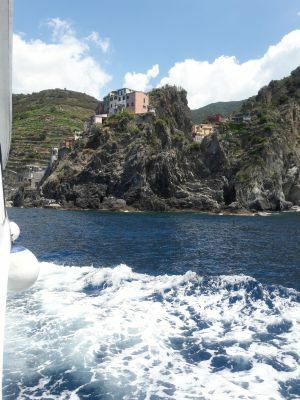 We were here last year as well - click here for a picture of the view from Fillipo's villa. 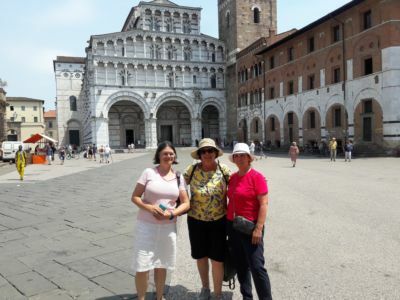 We did a little touring on the way here and will do more on the way back to Rome where we will spend a few days. 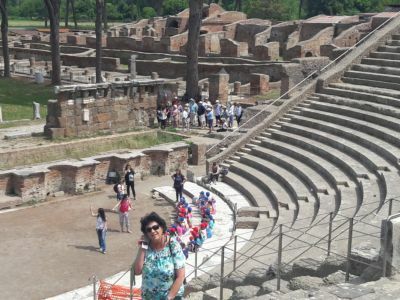 We again visited Ostia Antica, the ancient seaport of Imperial Rome. 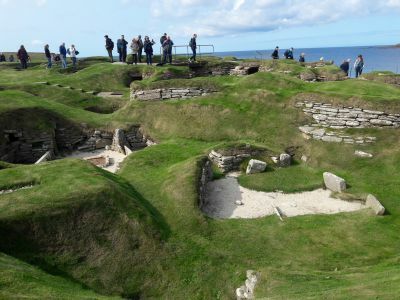 The site has been extensively excavated since our last visit there years ago and we enjoyed our too short visit this time. In the theatre that held 4,000 people, I am listening to the audioguide. 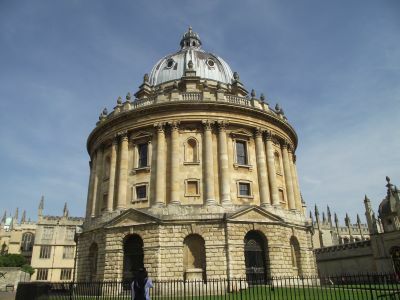 In the rooms surrounding the green lawn were guild houses with mosaics referring to their trade, like a huge ceramic jar for the transport of oil, or a mosaic of an elephant, deer and a wild boar imported for contests between gladiators and animals. 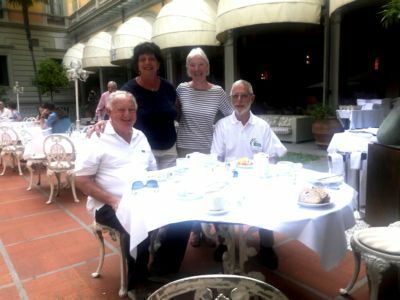 While the men were having their meeetings Claude Aubry and Maureen Porteous joined me on a day trip to Arezzo. 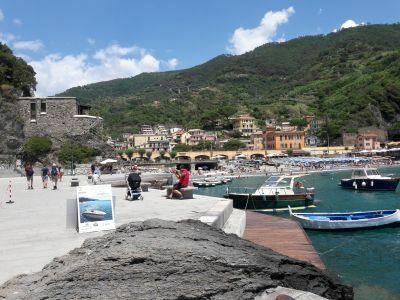 The Piazza Grande is the main square where we stopped for a coffee. 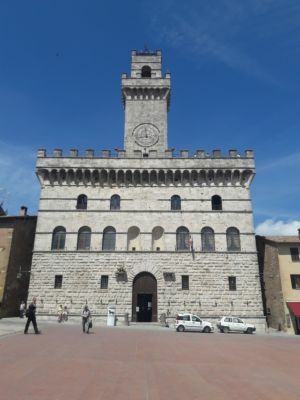 When Eitan and I visited Arezzo a number of years ago we watched takes of a movie being filmed. Imagine our surprise when seeing the movie Life is Beautiful we suddenly recognized what we had seen being photographed again and again. 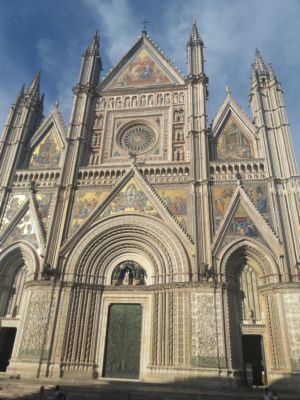 The Cathedral at Orvieto is quite magnificent both inside and out; the golden mosaics glittering in the afternoon sun were stunning while the fabulous frescoes inside are worth visiting again and again. 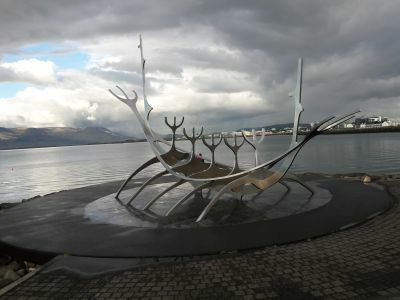 When the meetings concluded there was some time to do some sightseeing. 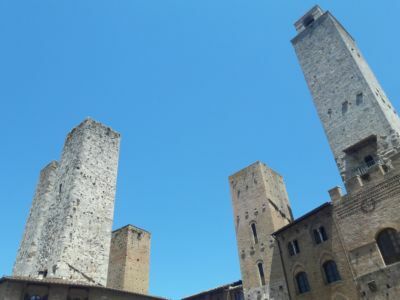 Eitan and I spent a delightful day at San Gimignano, dubbed the manhattan of Tuscany with its soaring stone towers and narrow streets. 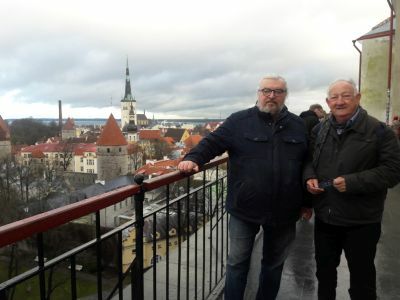 We spent a few days in Prague, where I organised a successful seminar to introduce the new laws of bridge to international bridge TDs (judges). 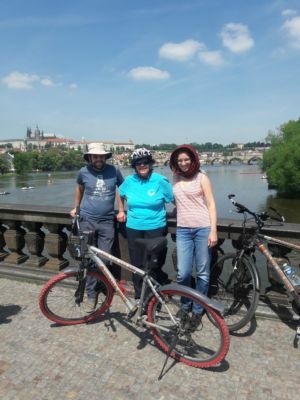 I didn't see much of Prague but Doreen did some sightseeing, including a bicycle tour. 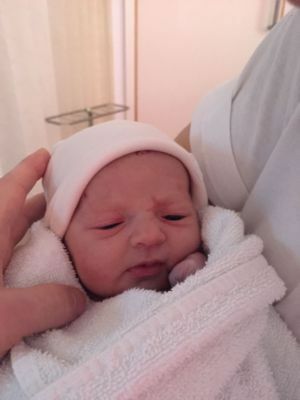 Tallulah May, a beautiful one-day old baby! 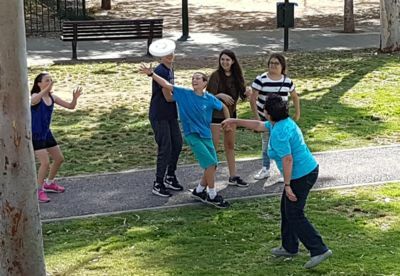 .... and played Frisbe with Doreen in the adjacent park. 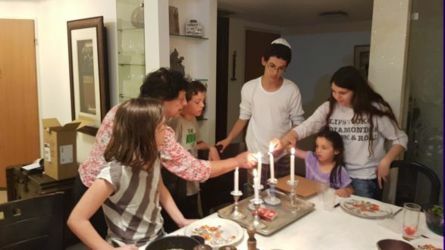 Grandson Maayan, aged 13, cooked the delicious meal. 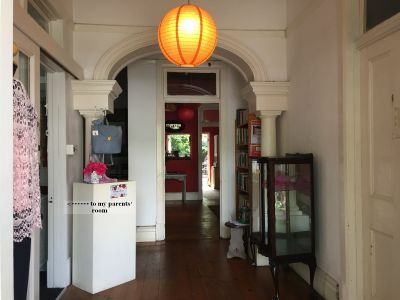 The theme was Indian cuisine and he prepared samosas, butter chicken curry and naan bread. 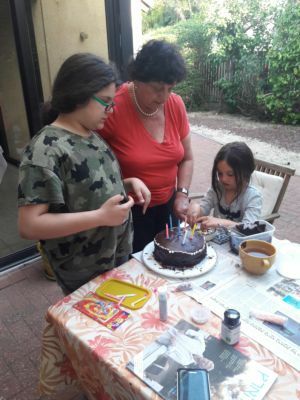 Decorating one of the cakes, Friday night kiddush, 4 granddaughters waiting to taste Maayan's cooking. 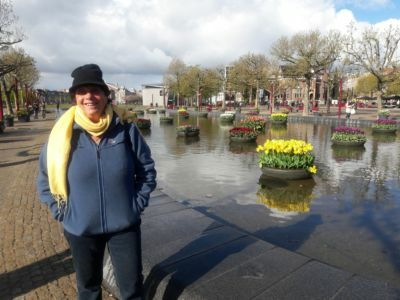 April 2017 - A quick visit to Amsterdam. 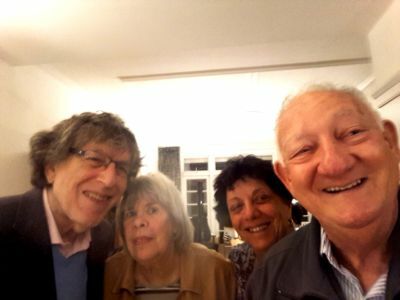 We spent 4 days in Amsterdam, visiting long-time friends Hans and Lottie Reijzer. Lottie is not well and we hope our visit cheered them up a little. 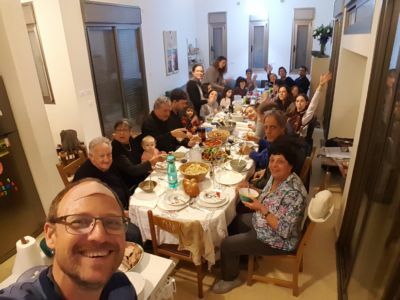 We have been close friends with the Reijzers since learning Hebrew with them on an ulpan in 1965. 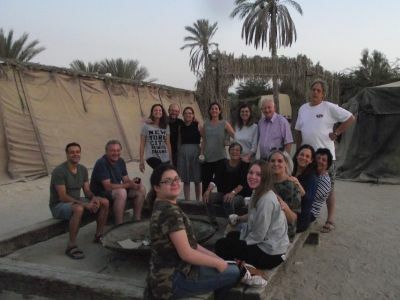 We see each other often, in Israel or Holland, and have a couple of times been together with them on a holiday, for example in Aups about 7 years ago. 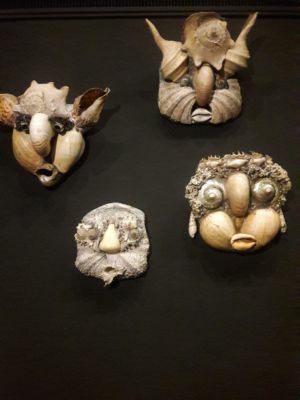 We also managed a short visit to the wonderful Rijks Museum, where we enjoyed the special exhibit on the relationship between South Africa and the Netherlands. 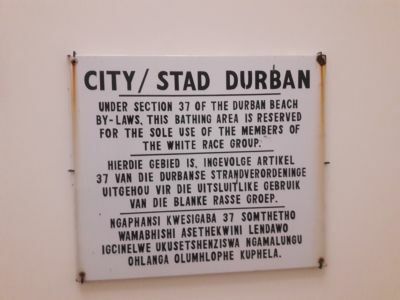 Our former home town Durban also got a mention, though not a very honourable one. 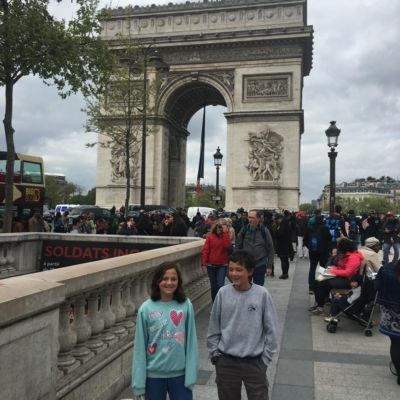 April 2017: Maayan and Lotem visit Paris with Saba Avraham and Savta Yael as a barmitzvah present for Maayan. 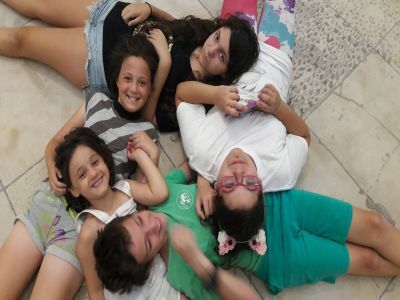 Go to Lotem's page and Maayan's page for more pictures. 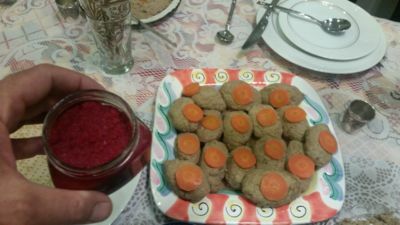 Reading the haggadah and enjoying traditional sinus-clearing ashkenazi chrain and gefilte fish. 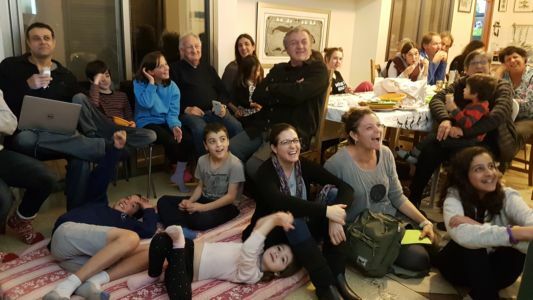 It's pre-Passover school holidays and five of our grandchildren are staying with us. 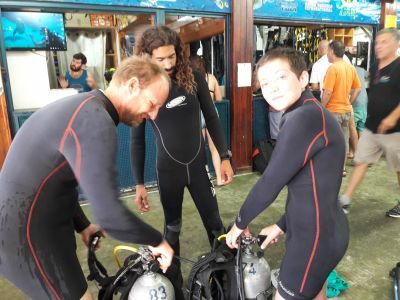 Son Moran is also here for a few days to help. 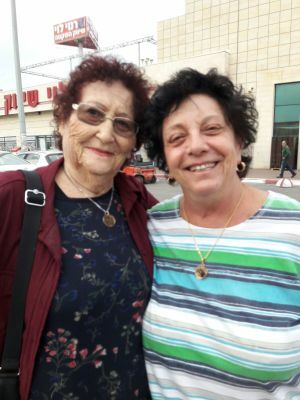 Doreen and Moran took them to the Holon Museum where the older children experienced the Dialogue in the Dark and Zoe the Enchanted Forest. 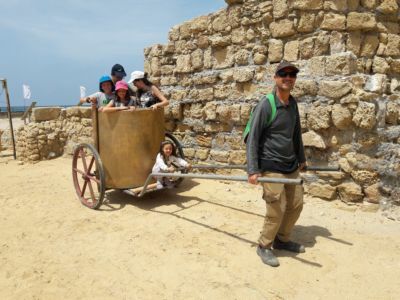 We experienced total darkness with our excellent guide Feisal, who himself has very limited vision. Helping us overcome some of our fears of the blanketing darkness and being overwhelmed by being so sound orientated, Feisal walked us through an imaginary park listening to birds, crossed a road, took a boat ride, felt clothes in a cupboard, listened to music while lying on the floor and then dancing to the music and ended by buying things from a kiosk and eating them, and finally having a discussion in the dark about the experience and what it is like to be blind. 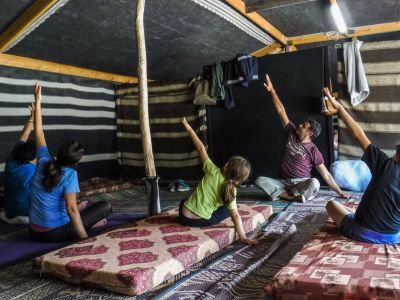 Perhaps the most surprising thing that Feisal told us is that blind people don't experience total darkness (which is the opposite of light) but nothing. It is a difficult concept to grasp. 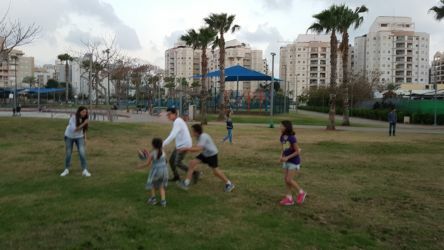 They played football in the local park, visited Caesarea, baked challah and will go to a movie. 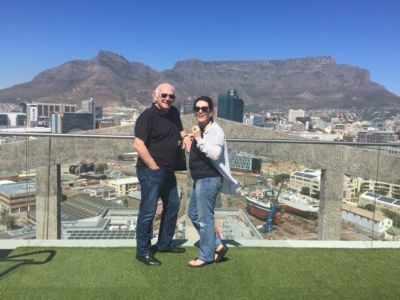 Ros (see Nochimovicz/Nickel family tree) and Claude Haskim of Sydney, Australia are enjoying a visit to South Africa. 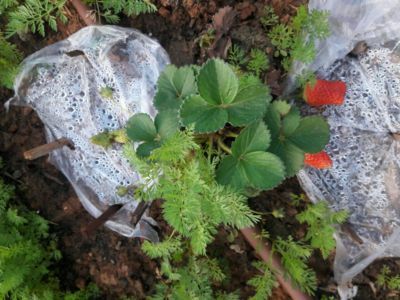 March 2017 - Spring is good for our garden! 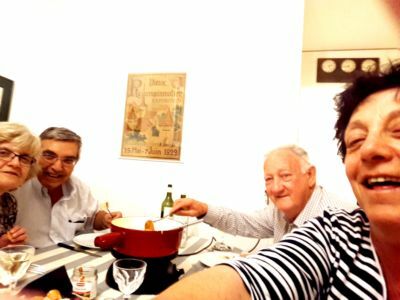 With Pierre and Francoise, enjoying 4 bottles of Swiss white wine from the area and a delicious cheese fondue prepared by Francoise. 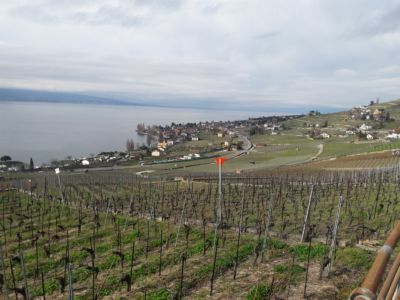 We visted the impressive vineyards of the Vevey area and enjoyed the beautiful views of the lake. Chaplin's World was a fascinating insight into the genius of Charlie Chaplin. 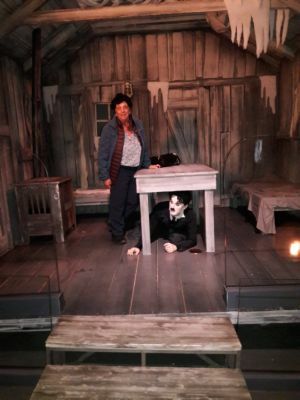 The recreations of some of his movie scenes were impressive, including the tottering shack seen in Gold Rush. 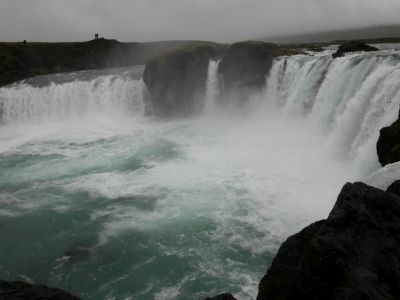 See another picture in the Archives of This Week's Picture. 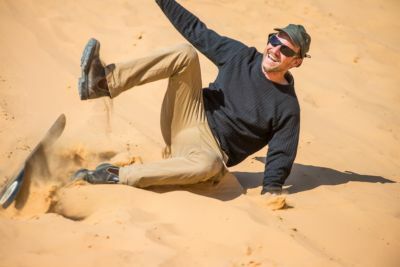 We learnt some interesting facts, including the shoe that he ate in one of his movies was made from licorice and caused extreme diarrhea afterwards! 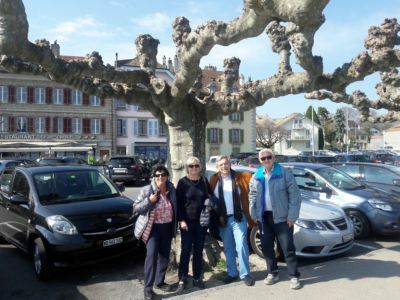 With Pierre and Francoise on a vist to Nyon and the medieval village of Yvoire in France. 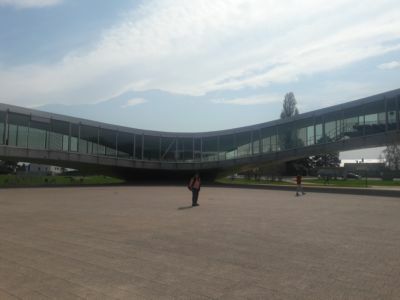 We were most impressed with the Rolex Learning Centre, both from an architectural point of view and from the large number of students taking advantage of the facilities in such conducive and relaxing conditions. 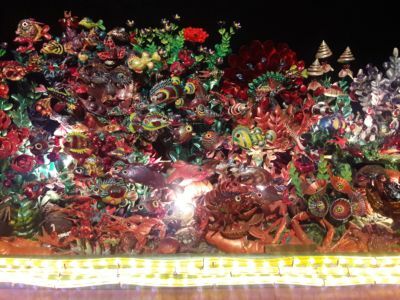 Doreen visited the Museum de l'Arte Brut and particularly enjoyed the shell assemblages. 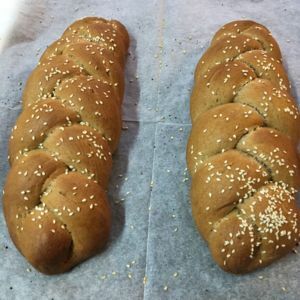 Following in her mother Doreen's footsteps Vered prepared a vegan challah for shabbat. 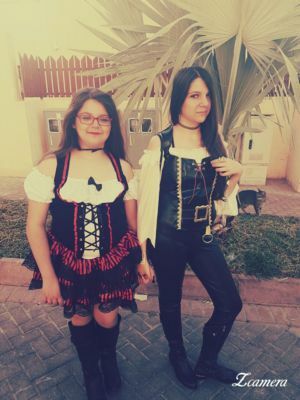 Limor (on the right in the first picture); Aviv (in the middle) with friends; Ilai (as Lady Vampire, Dracula's wife and Amit as a pirate. 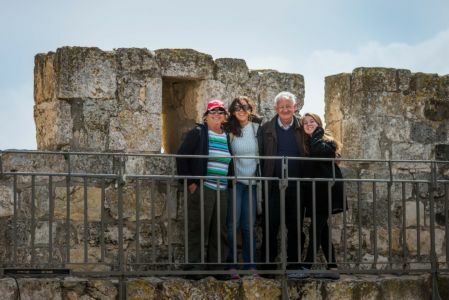 Doreen had a free day on her tour and the Rons Vered, Aviv and Lior, and I joined her for lunch and a walk along the ramparts of Jerusalem. 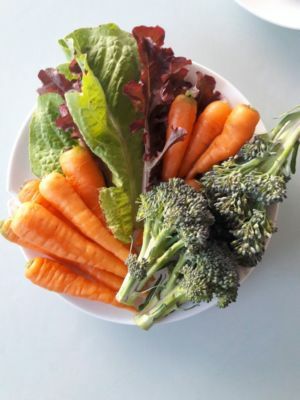 Our vegetable patch at the Municpal allotment is showing improvement - broccoli, lettuces, cauliflower. 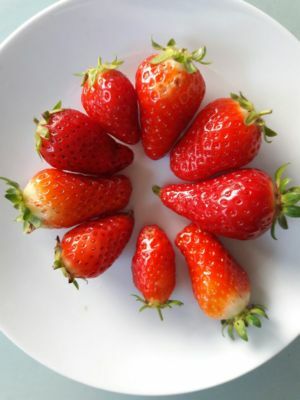 Our strawberry yeald has doubled: one (delicious) strawberry a month ago, now two! Son Moran is jealous of our achievement. 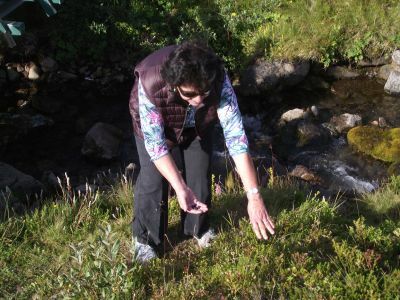 As he wrote: "We did a two year study and only improved the yield by 10%"
We renewed acquaintance with relative Susan Nathan a few months ago (see picture) and today we drove to the town of Tamra to visit her. 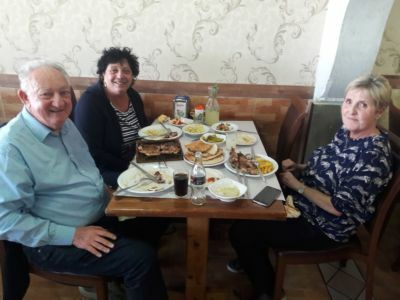 She lives in a very nice apartment there and we enjoyed the visit and also the excellent, and very reasonably priced, lunch at the Alotmanee Restaurant. 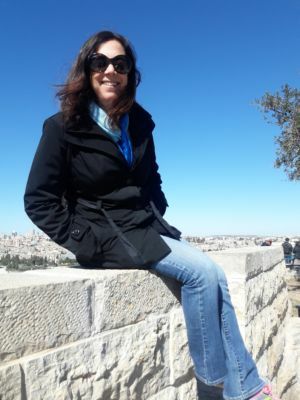 February 2017 - Shai Rishoni does the Tel Aviv Marathon. 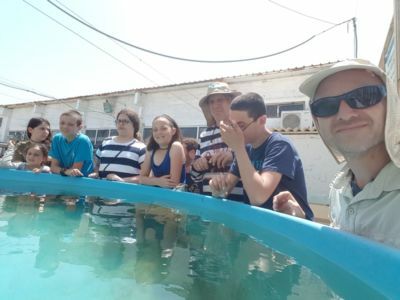 This week we pay tribute to Shai Rishonim who has inspired us with his incredible bravery and determination. 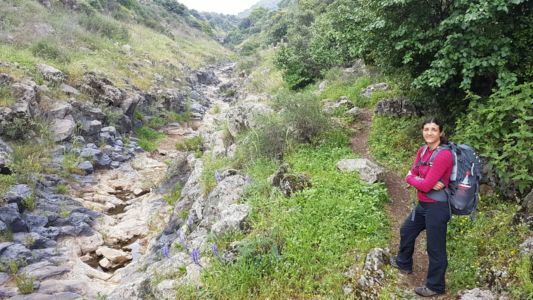 Shai was a commercial pilot who had trekked the Himaslayas, been an Ironman Triathlete who had competed in marathons and other endurance and strength events. Five years ago he was diagnosed with ALS ("Lou Gehrig disease) and his degeneration of muscle use was rapid. 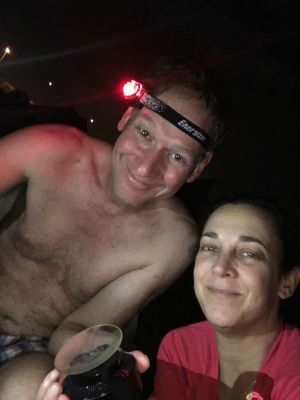 Today he is almost totally paralysed (except for eye movement) and ventilated, yet he is the driving force behind, and functions as the CEO, of Prize4Life, a not-for-profit organization aimed at accelerating the discovery of treatment and cure for ALS. 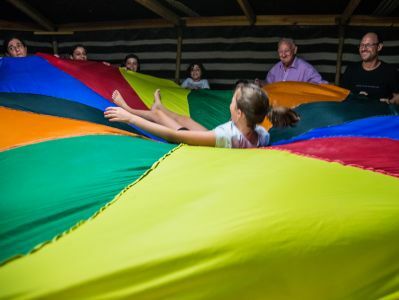 Every year he organizes a fund-raising event for the organization. 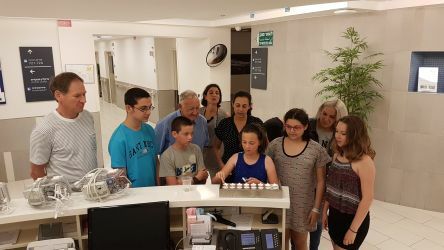 This year it was a concert featuring a popular Israel band, and there we bought a book written by his son who gives a moving account of adapting to an ALS impeded father. 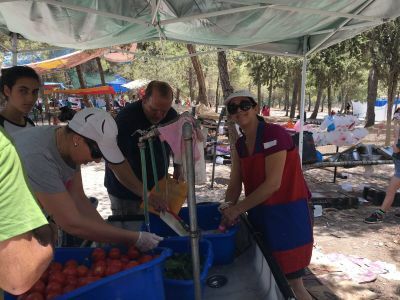 We are proud that our daughter, Vered, is on the board of this organization. 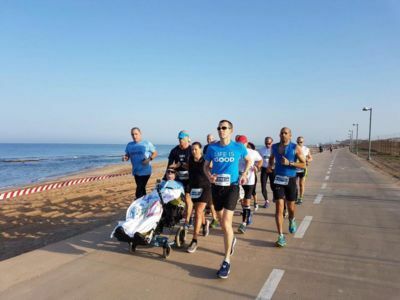 On Friday the annual Samsung Tel Aviv Marathon took place. 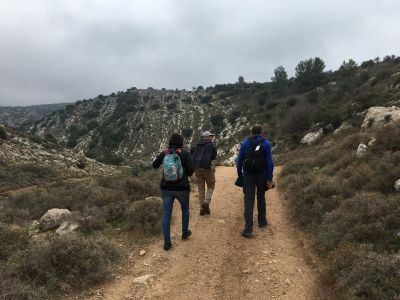 Among the 40,000 participants was Shai who decided that he would "run" the marathon with the help of volunteers who would take turns pushing him. 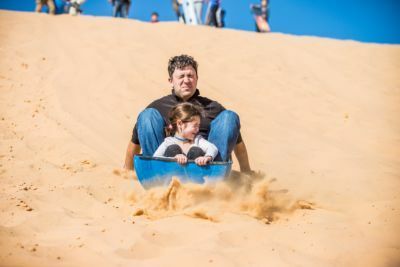 It couldn't have been easy for him being pushed and jolted for something like 5 hours without a break, but his determination and courage ensured that he was successful. 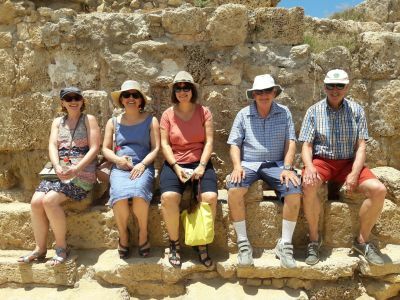 Doreen enjoyed taking a small group of business people on a tour to Jerusalem, the Old City and Machaneh Yehuda market. 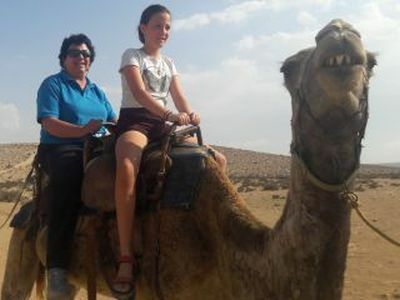 She was accompanied by daughter Vered. 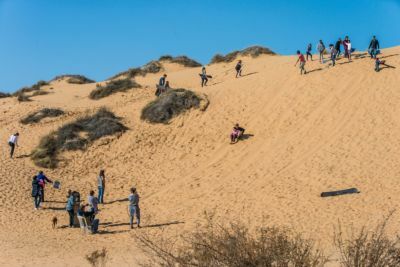 late afternoon at Wadi Zinn near Midreshet Ben Gurion where they live. 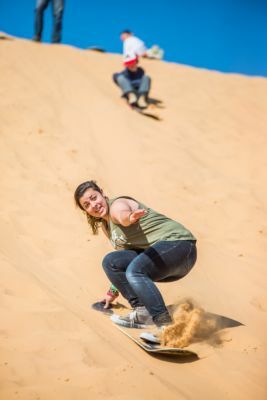 On the way they saw the impressive desert views. 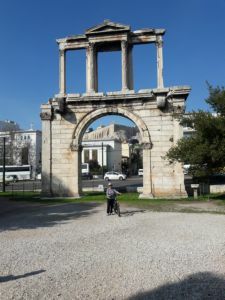 I organised a workshop for bridge directors (judges) in Athens and Doreen took the opportunity of seeing some of Athens she had missed on her previous trip. 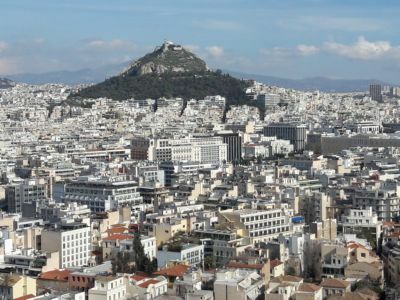 Highlight of my 4-hour bike ride around Athens was riding up Lycabettus Hill – even with an electric bike much pedaling and hard breathing was required. The last 10 excrutiating minutes were climbed by foot for a magnificent view over Athens and Pireaus. 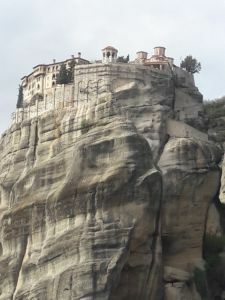 www.e-ride.gr Well recommended for a street level view of Athens. 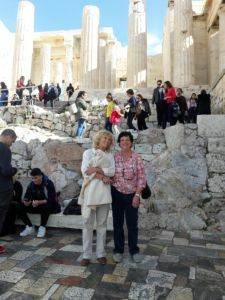 Yola Latala and Doreen walking around the Acropolis. 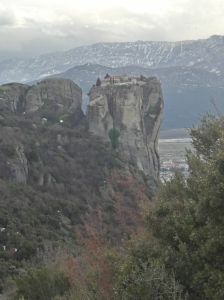 With only 1 day to spare I took a 5-hour train ride to Kalabaka in order to visit Meteora. 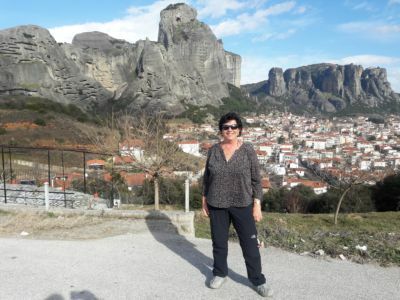 The huge hills rise straight up from the ground towering over the small village. 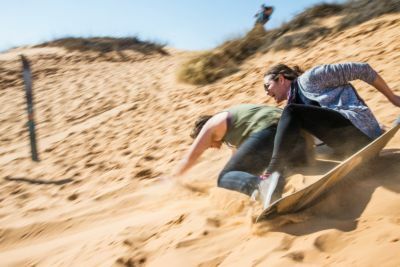 was emerging. 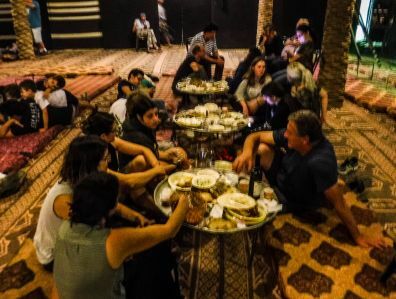 We even saw spontaneous Greek dancing in a tavern. I was delighted to buy a face serum made from donkey’s milk! See another picture in the Archives. 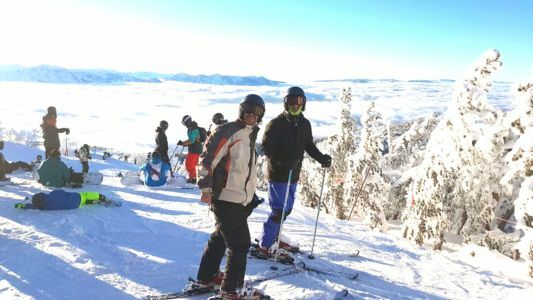 Son Moran Segoli went with log-time friend Ran Kagan on a short ski vacation to USA. 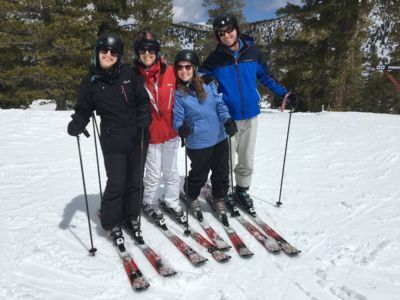 There was plenty of snow and they had a great time. 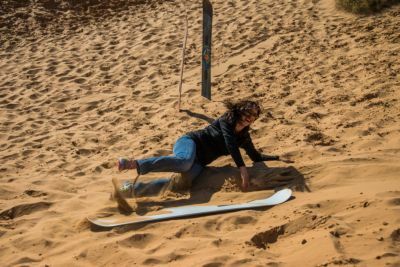 As this video shows Moran is very good at ski jumps but not so good at landings. 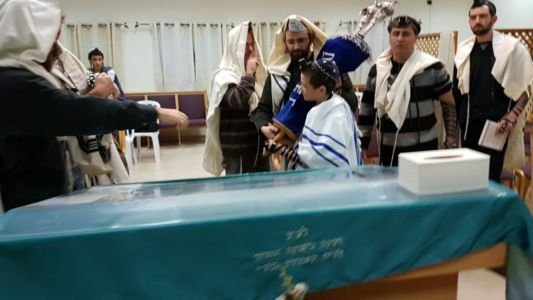 See This Week's Picture archives for a picture of the barmitzvah ceremony.